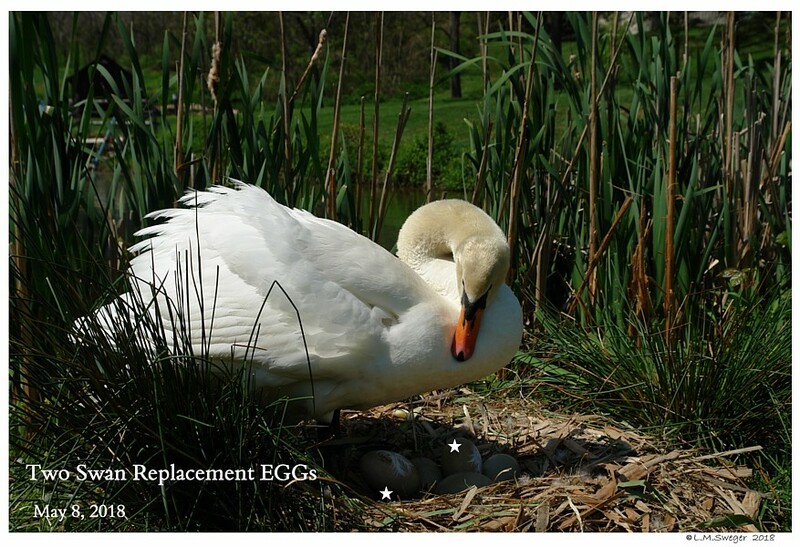 AND > Basic Procedure to Swap-Out Eggs when Needed. 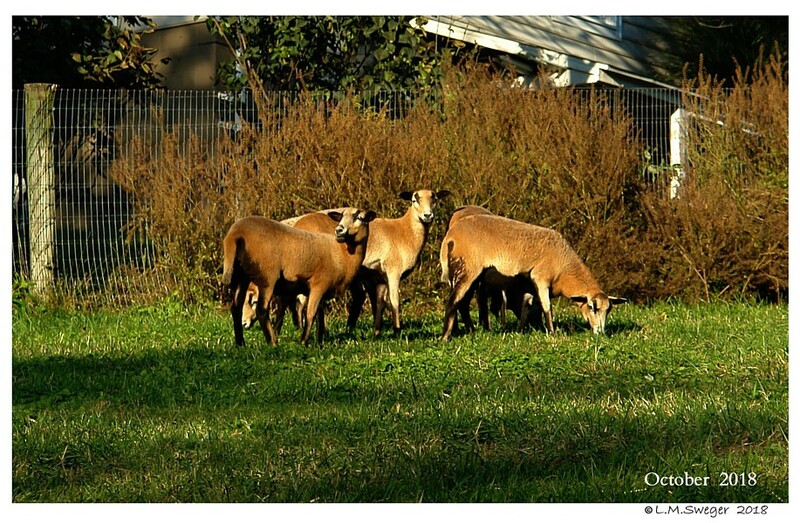 TO ENLARGE Images: Right Click on Image – Open Images in New Tab. 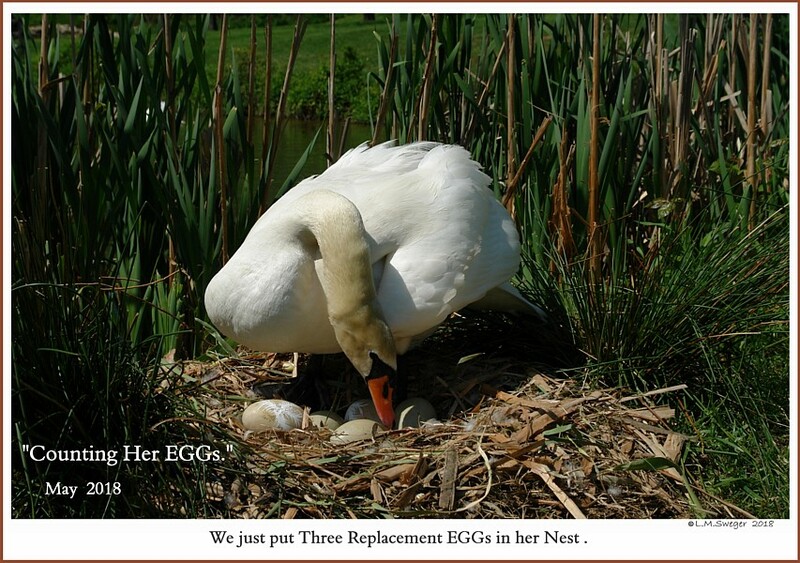 there have been a Number of Times having Replacement Eggs has been Helpful. 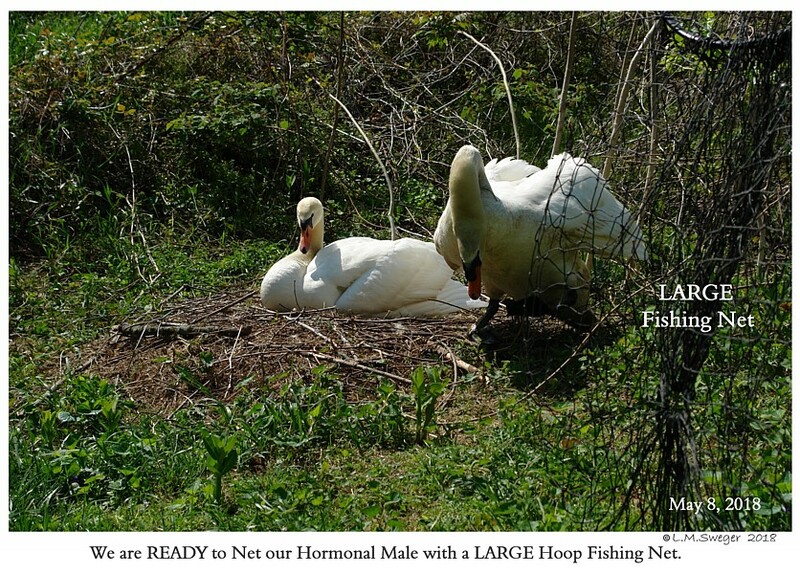 and Lay Eggs with or without a Male/Mate. 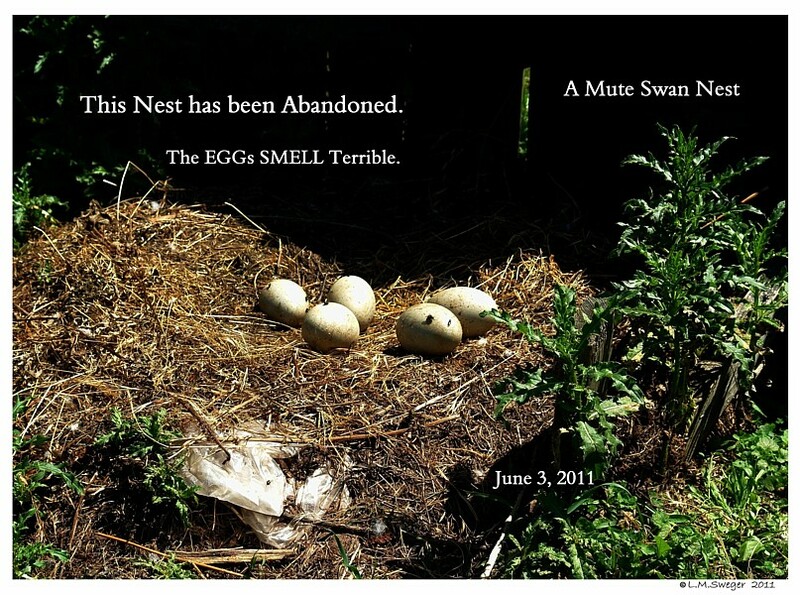 Rot and SMELL TERRIBLE before they can be Removed from the Nest. 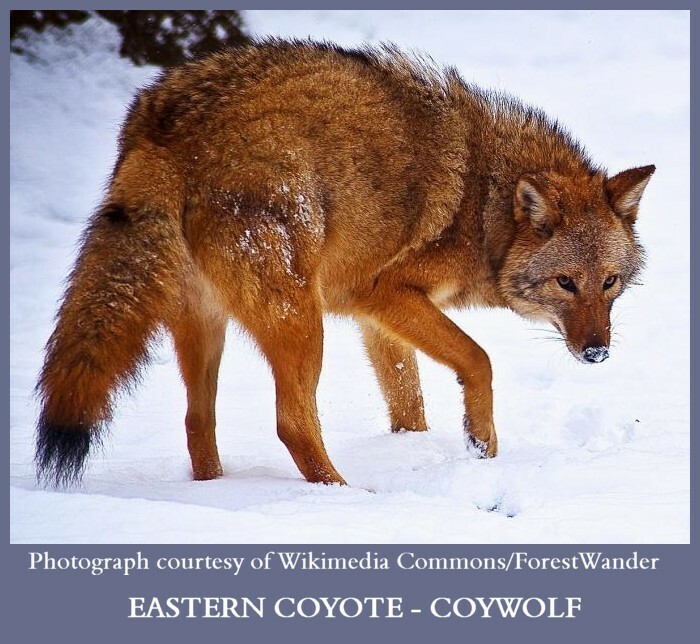 There are Nest Raiders.. Likely Raccoons Stealing Eggs. 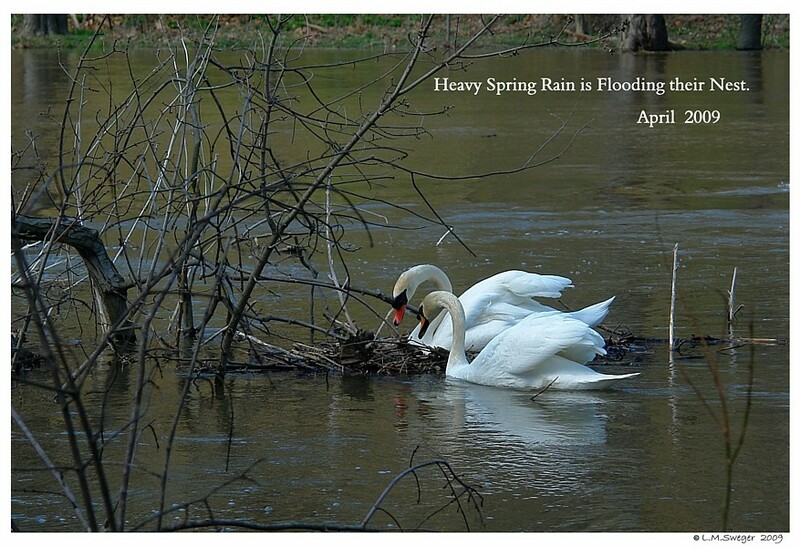 Heavy Spring Rain may Soak and Spoil Eggs. 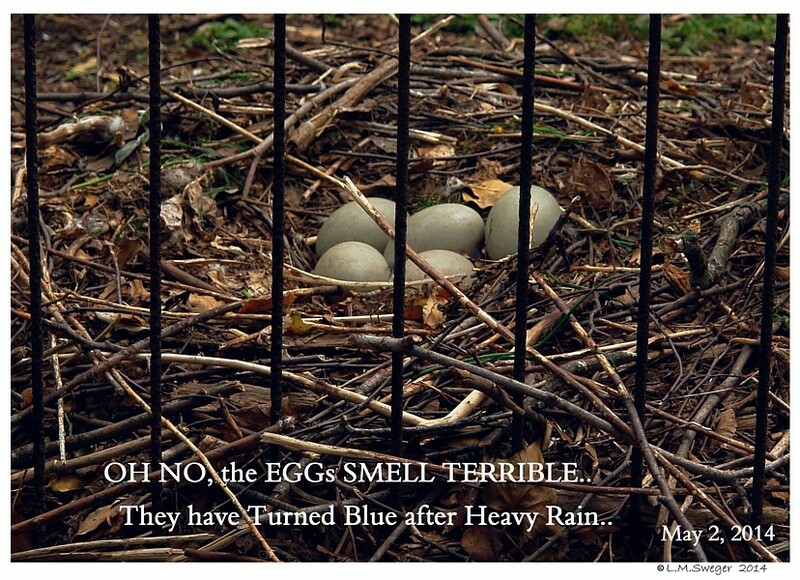 The Eggs Turn Blue once they are Too Wet.. 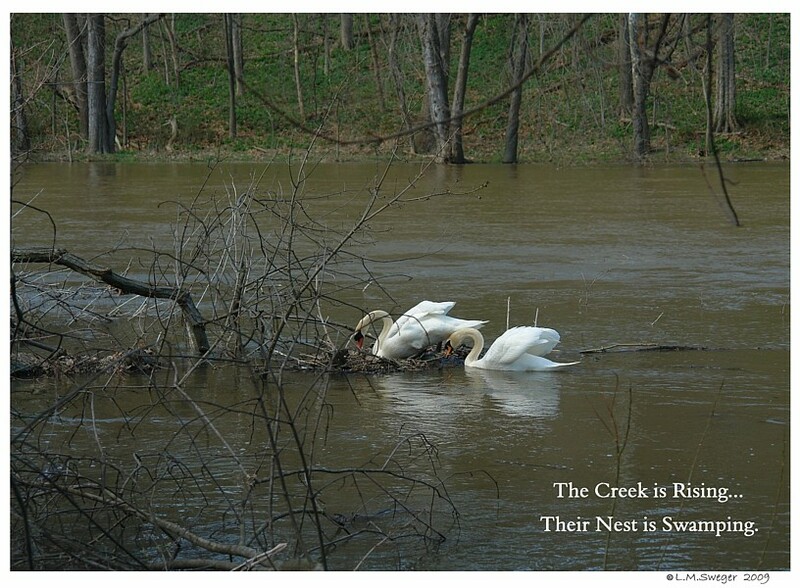 Many Times the Developing Embryos will Drown. 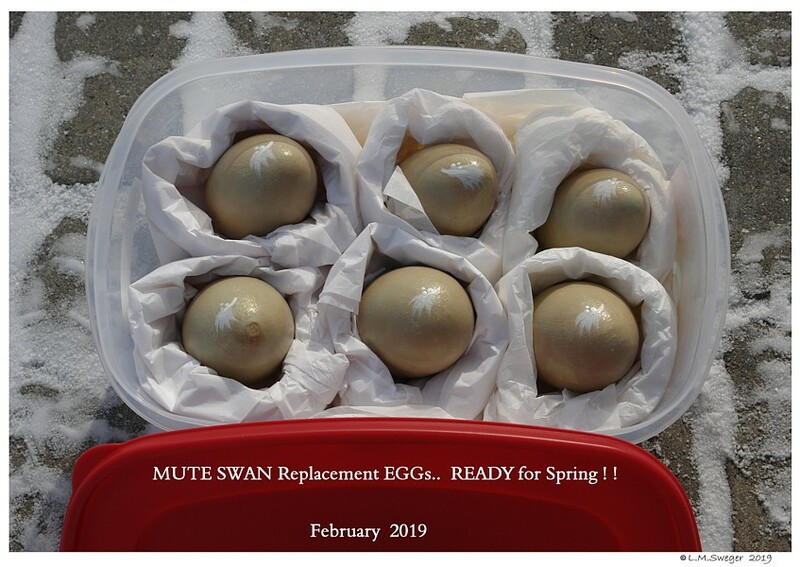 while still Laying her Clutch, a very Frosty Night may Freeze the Eggs. 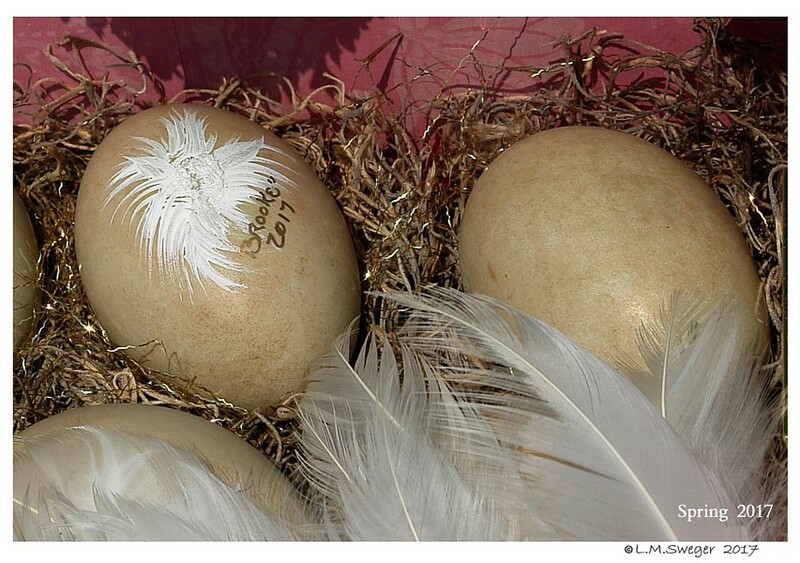 Little Chance these will Hatch. 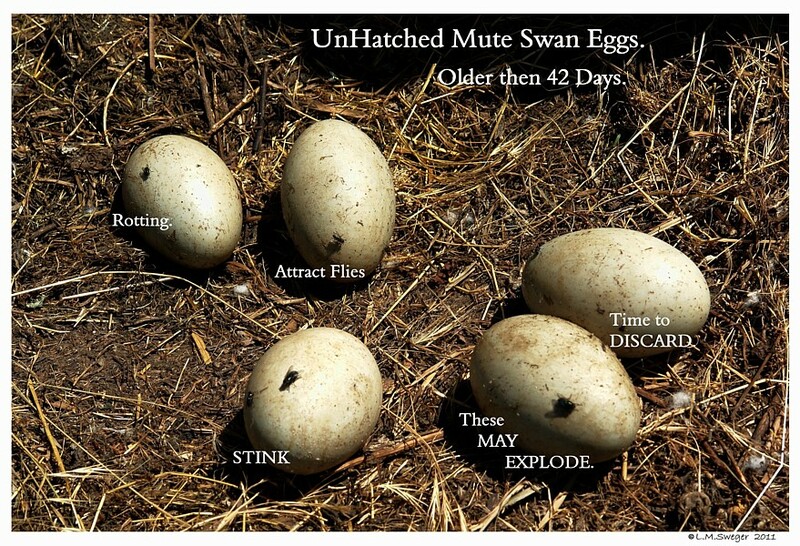 If for any Given Year, you want to Prevent Eggs Hatching. 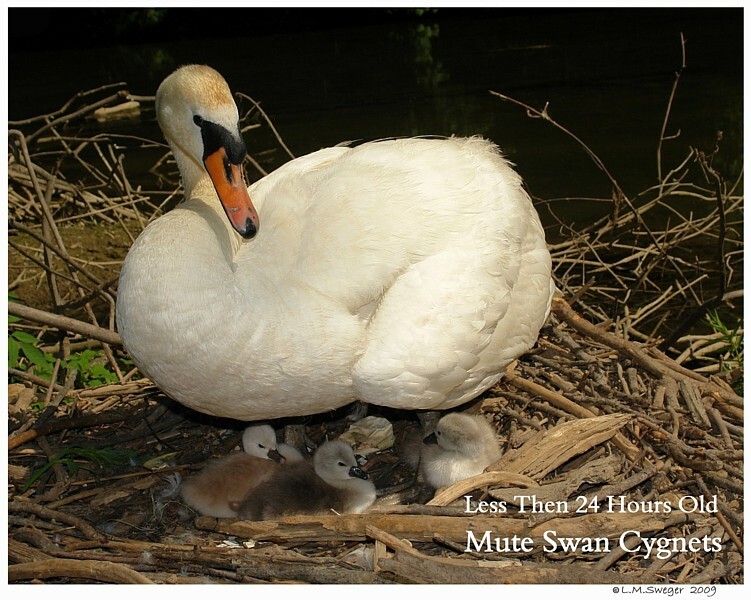 Maybe you do not want to Deal with Cygnets.. Lots of Work. 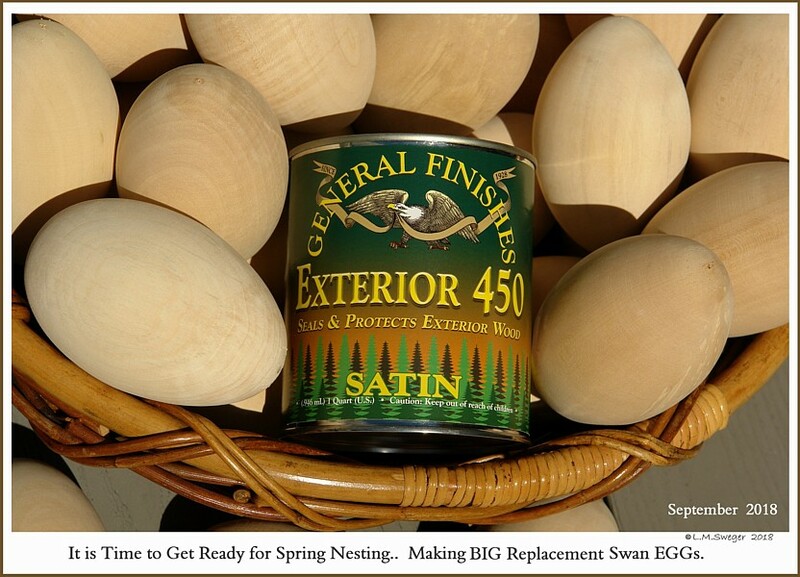 The Eggs can be Spoiled by Spraying or Oiling..
OR you can Replace the Real Eggs with Life Like Replacements. 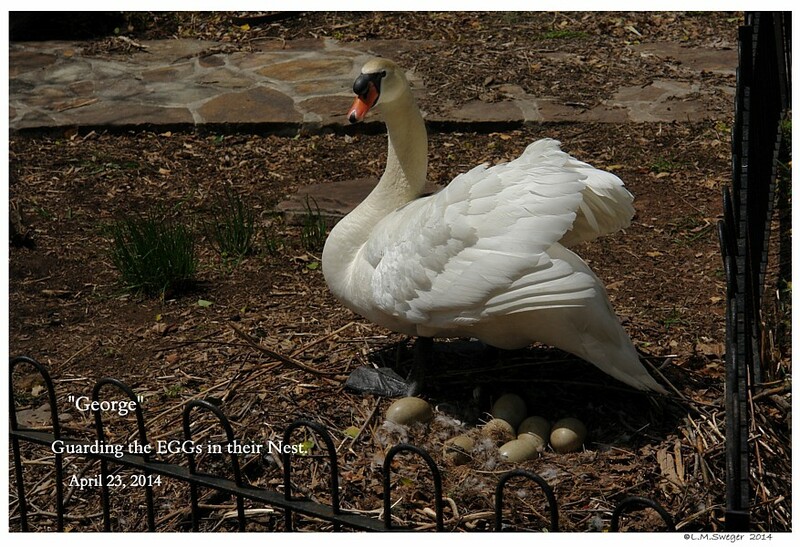 the State Policy may NOT Allow their Eggs to Hatch. 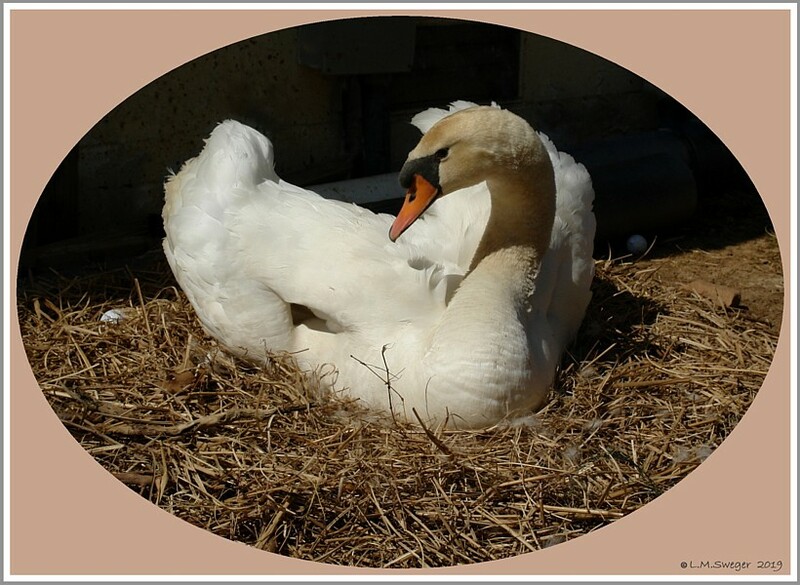 If your Swan Pair are from the Same Brood and you Determine it is more Responsible to Prevent their Eggs Hatching. 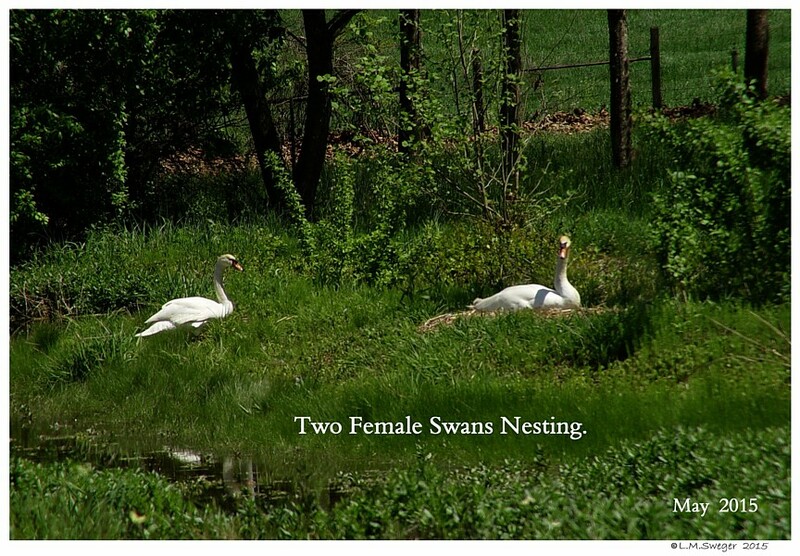 Often Young Swans are Acquired from the Same Parent Swans.. Reducing Genetic Diversity. 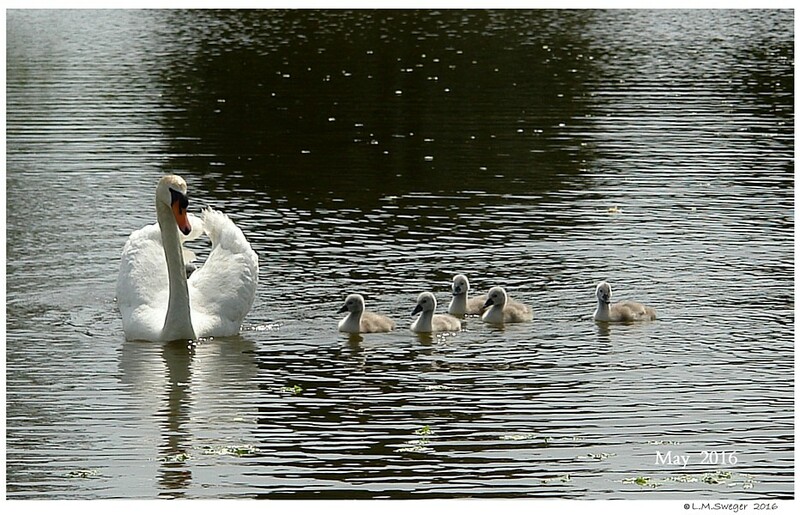 We Rescued these Young Cygnets. 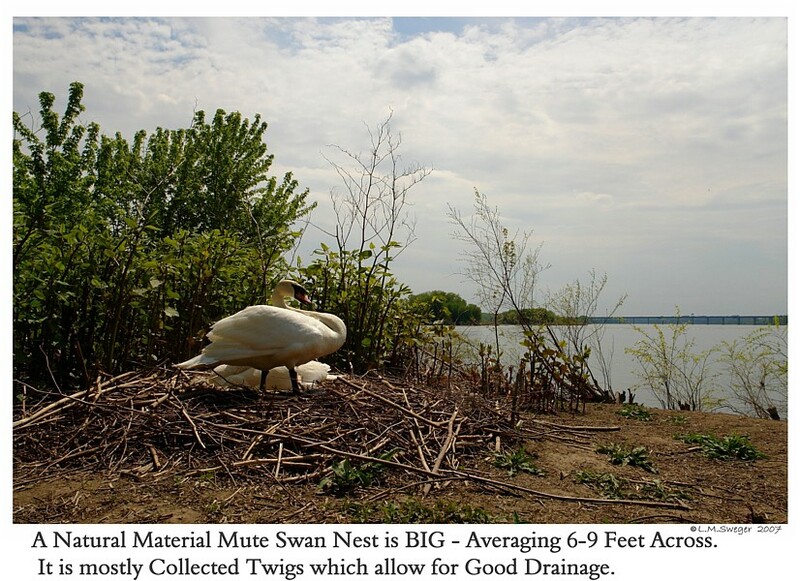 Male and a Female Nest Mates. 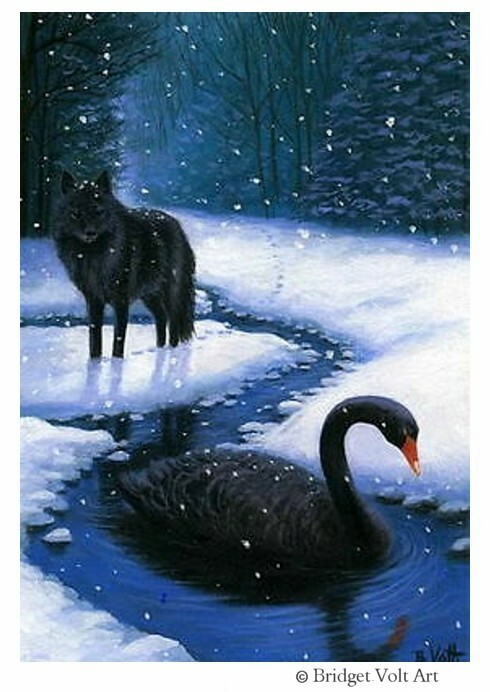 It would have been Easy to find them a Home Together. 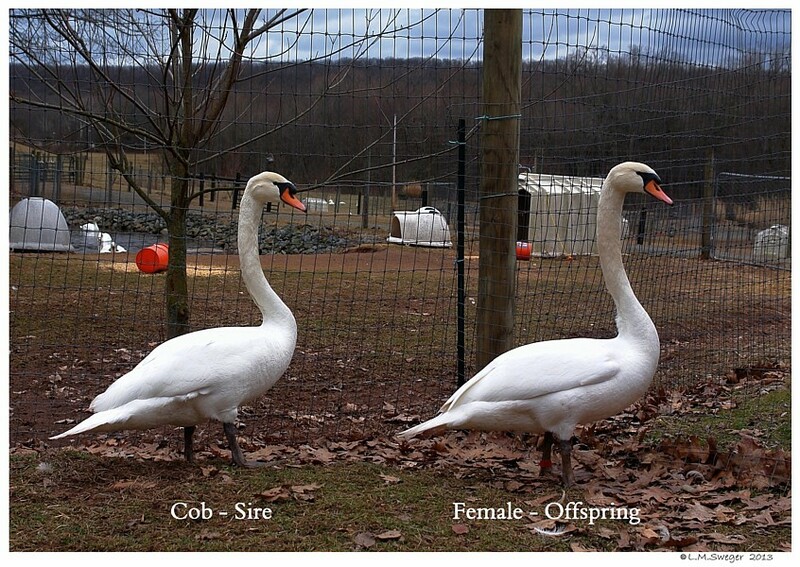 To Prevent Inbreeding, we Arrange Different Forever Homes. 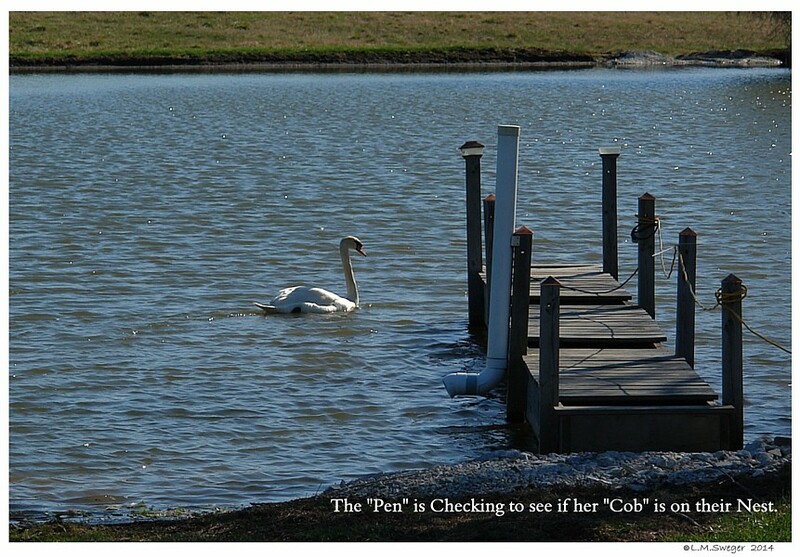 OR as in the Example Below: The Mature Pen Died. 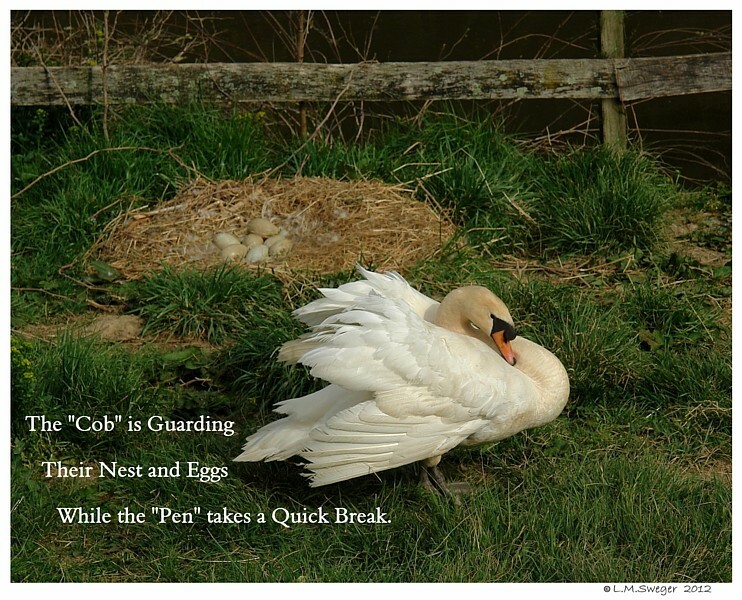 The Cob Bonded with his Female Offspring.. ( His Daughter ). 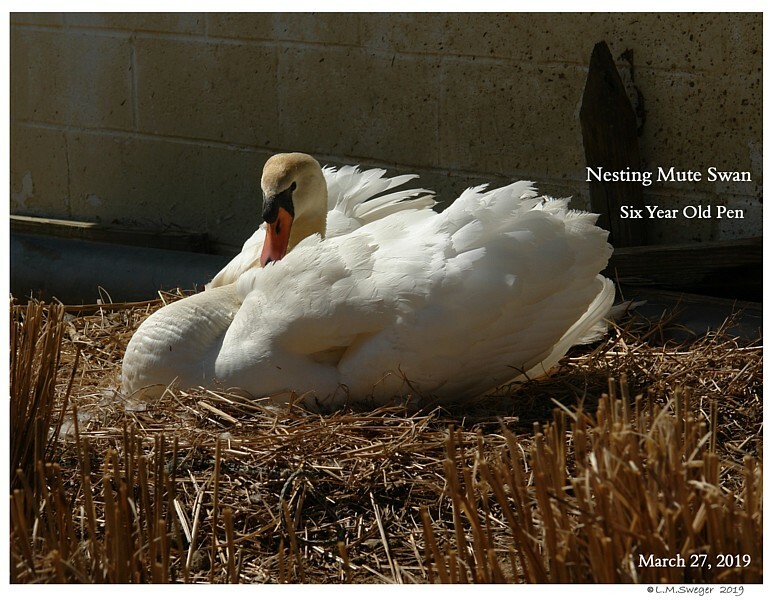 The Owners decided to Rehome them to Different Homes after they had been Mating and Nesting. 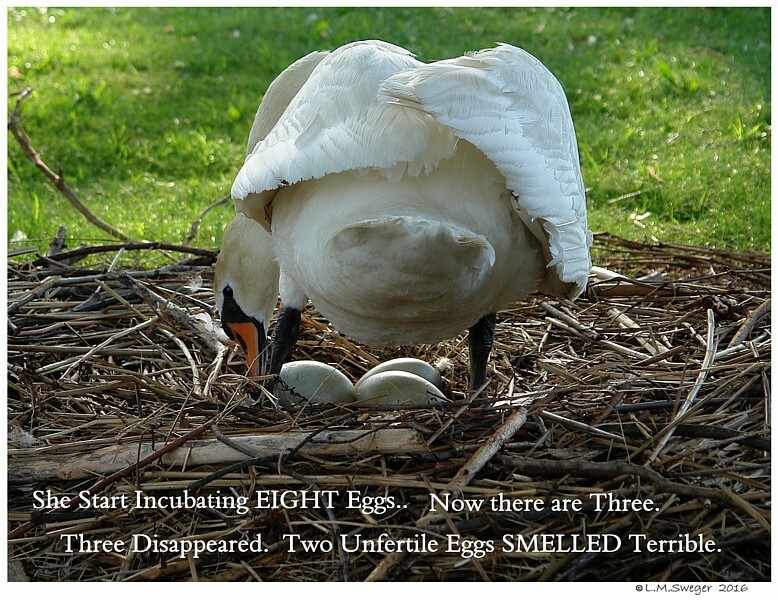 Their Eggs were Not Allowed to Hatch. 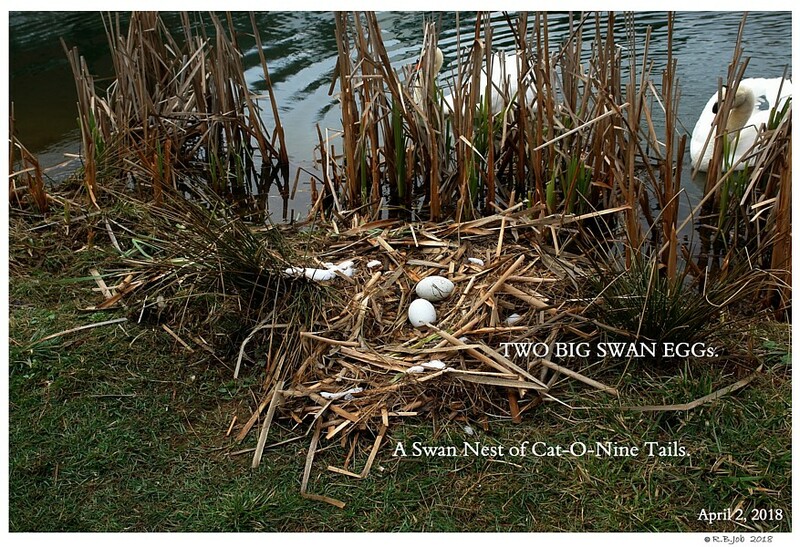 Now they are Both with Unrelated Mates for Healthier Cygnets. 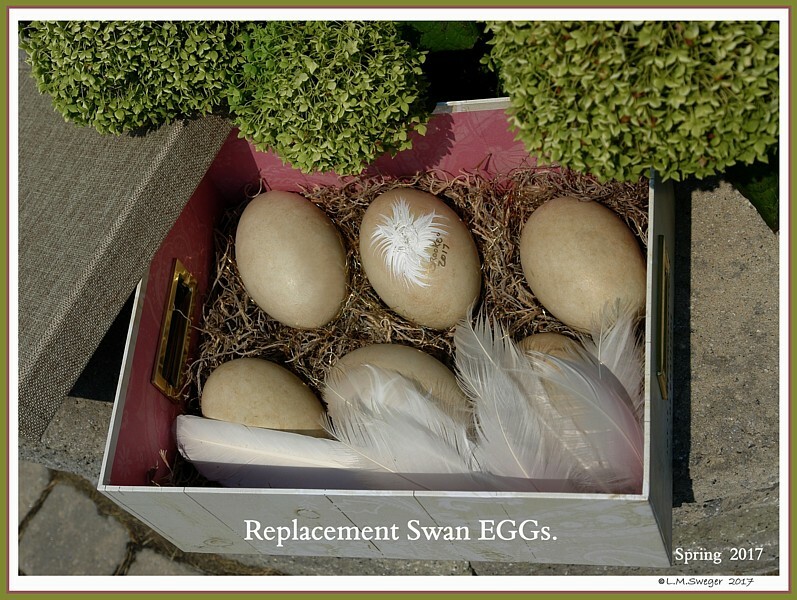 Having Replacement Eggs can be VERY Handy..
Use them – then Wipe them off and Store for Future Years. 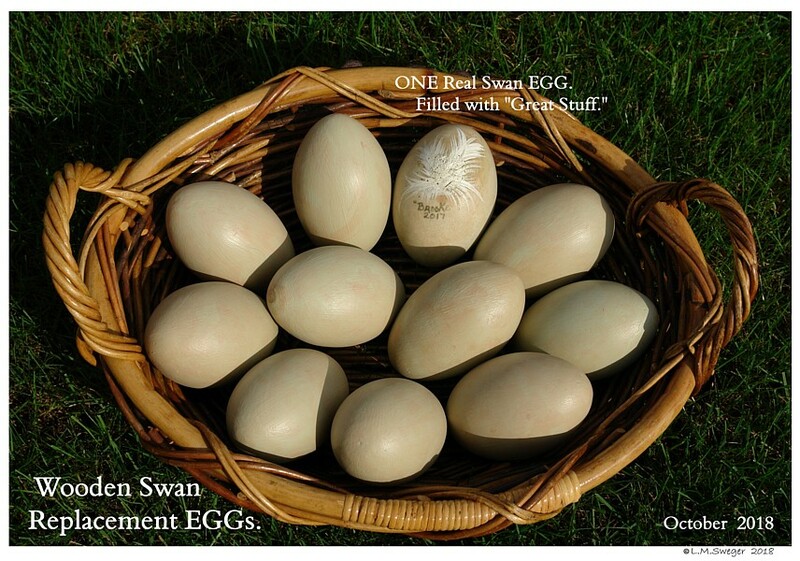 The UnHatched-Unfertile Mute Swan Eggs that I Drained and Filled with “Great Stuff” Foam. 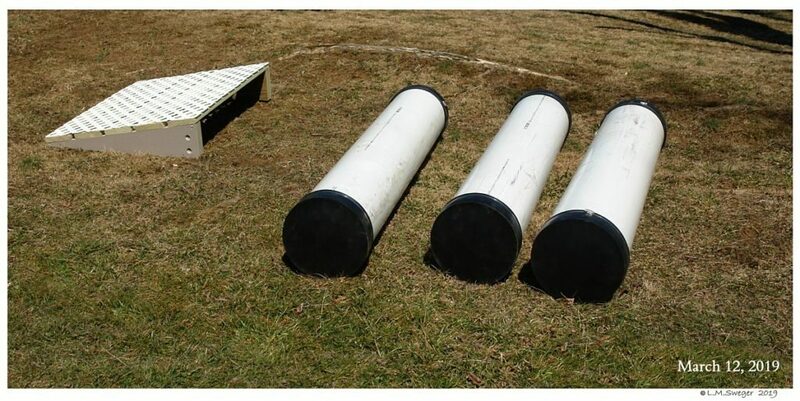 These were a Little Light Weight. I Painted a Sorta Feather over the Plugged Hole. To Sorta Hide the Spot. 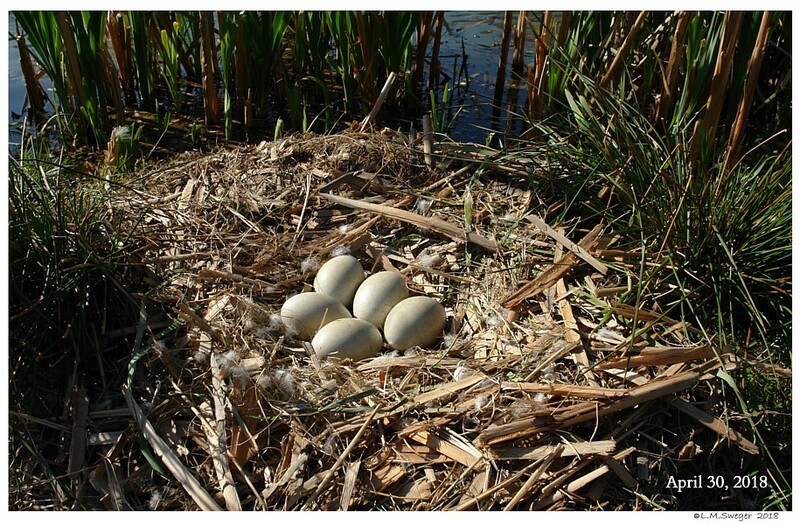 All but One Real-Filled Eggs was Accepted by our Nesting Pens. 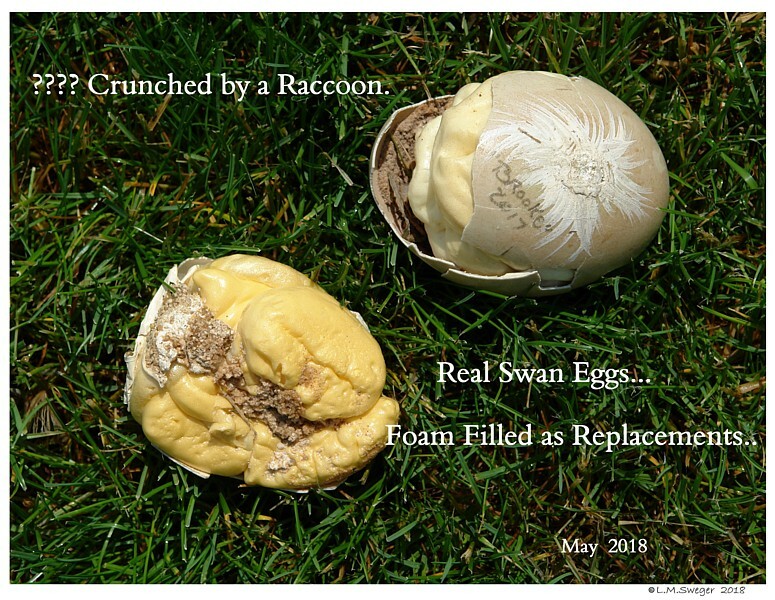 TO my Disappointment, a Raccoon started to Steal my Real Replacement Eggs and Crewed them into Pieces.. DARN. 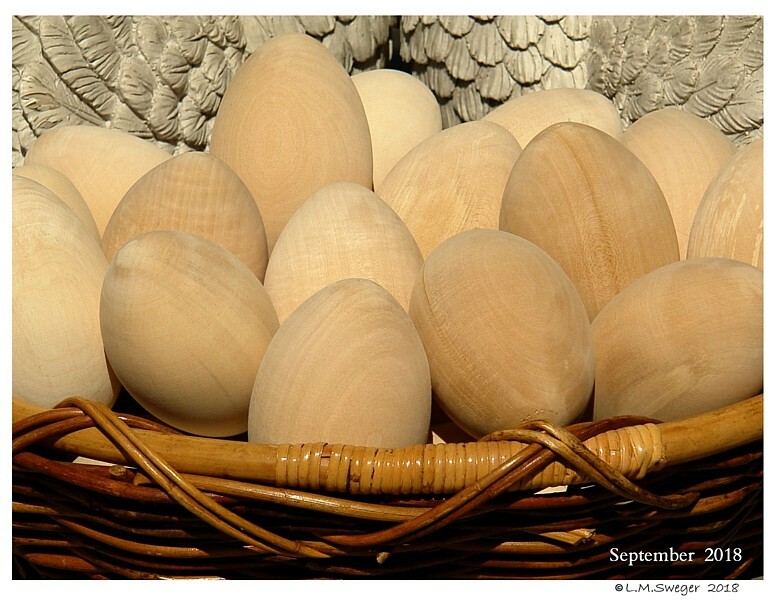 My Next Plan: WOODEN Eggs.. Turned. They were Happy to Help. 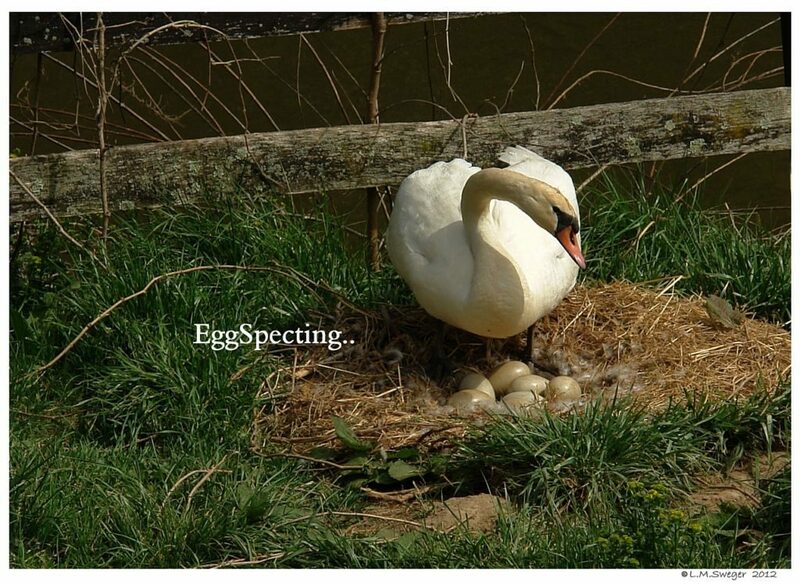 I took a Gentleman One of my Real Eggs for the Template. 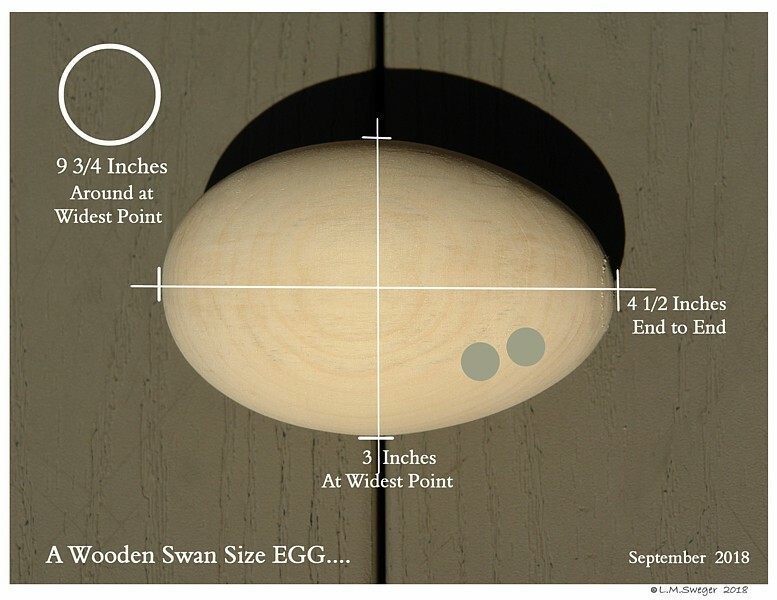 Below are the Measurement of an Average Size Mute Swan Egg. 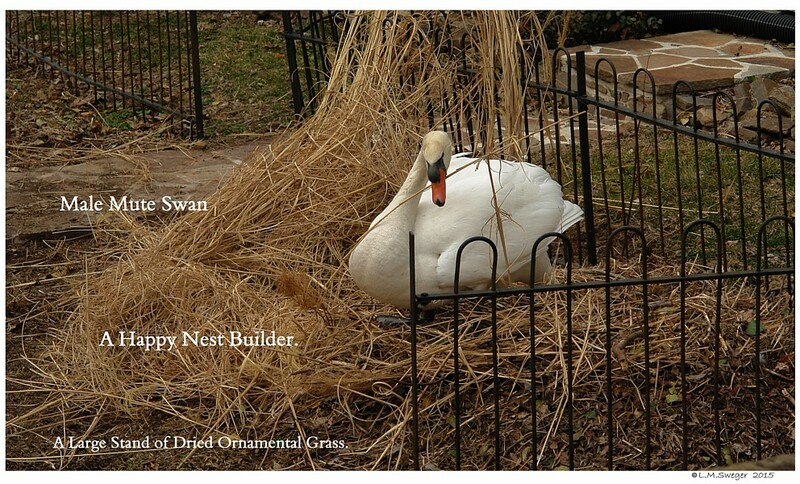 The Craftsman did a GREAT Job. 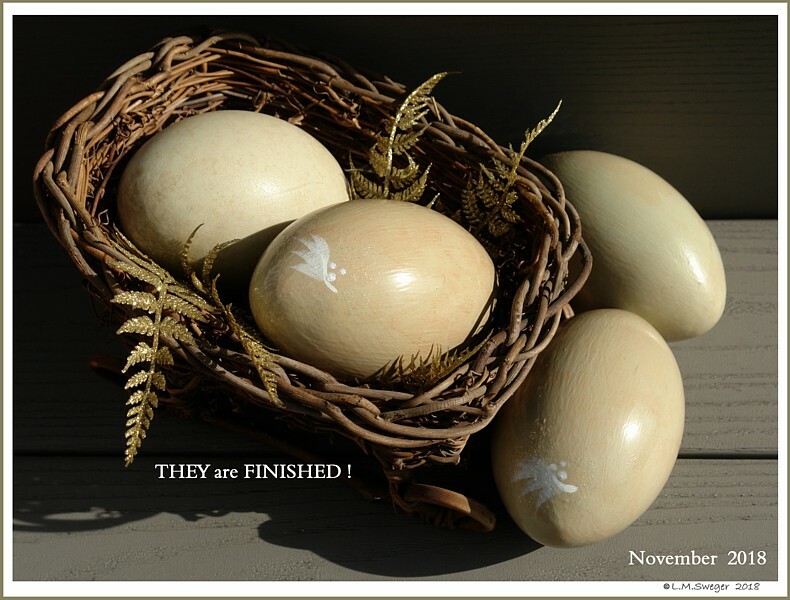 Now it is Up to Me to Paint & Seal them. 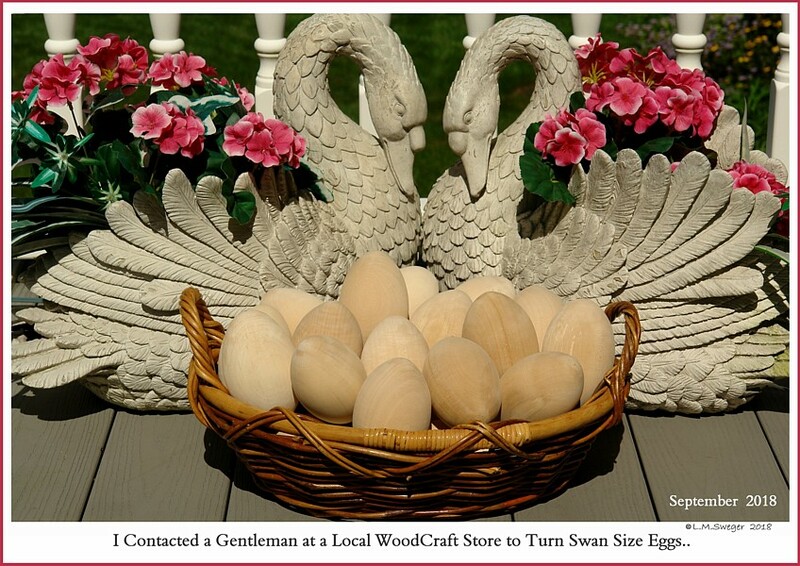 He used Heavy Dense Wood.. BIRCH. 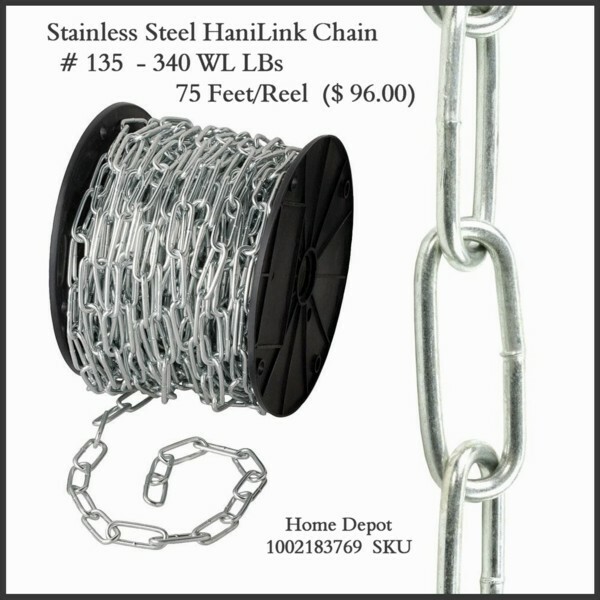 The Weight is Pretty Good. 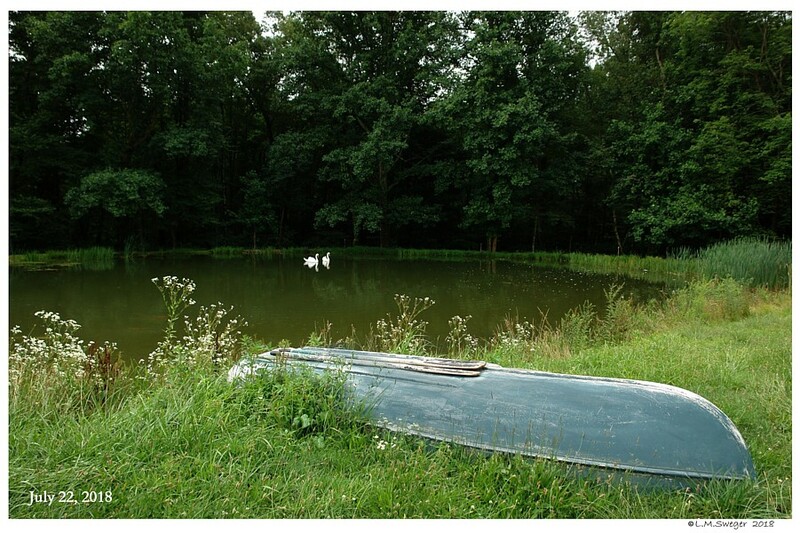 Birch wood is a Hardwood that is Extremely Strong. and the Outer Finish Product for Outside Wood Items. 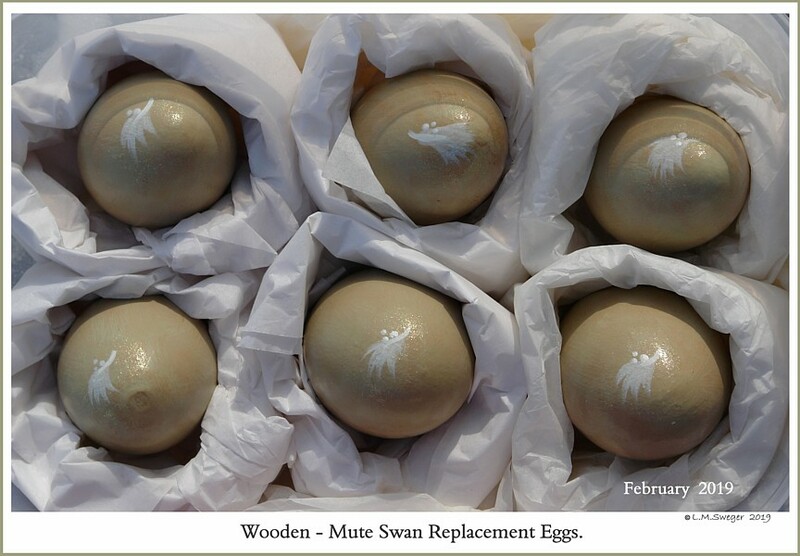 For the Mute Swan Egg Colors I used the Small Bottles of Acrylic Craft Paints to Tint the Sealer. 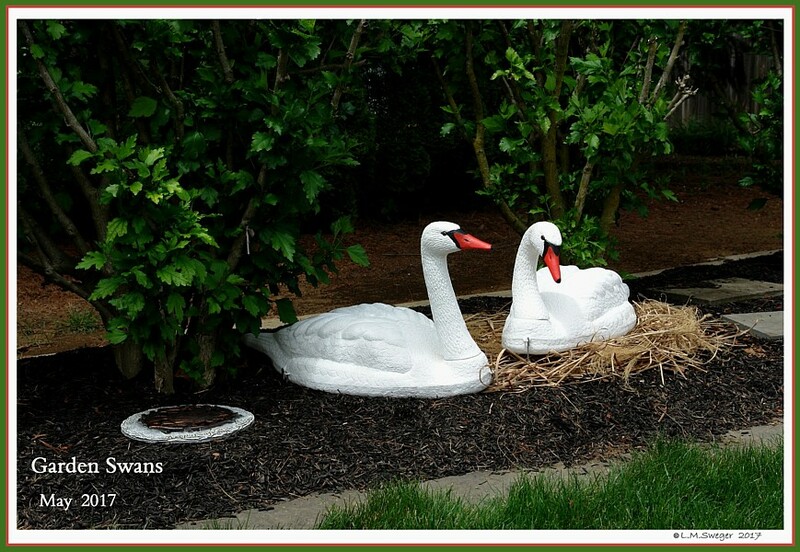 The Colors will Vary with the Different Species of Swans. 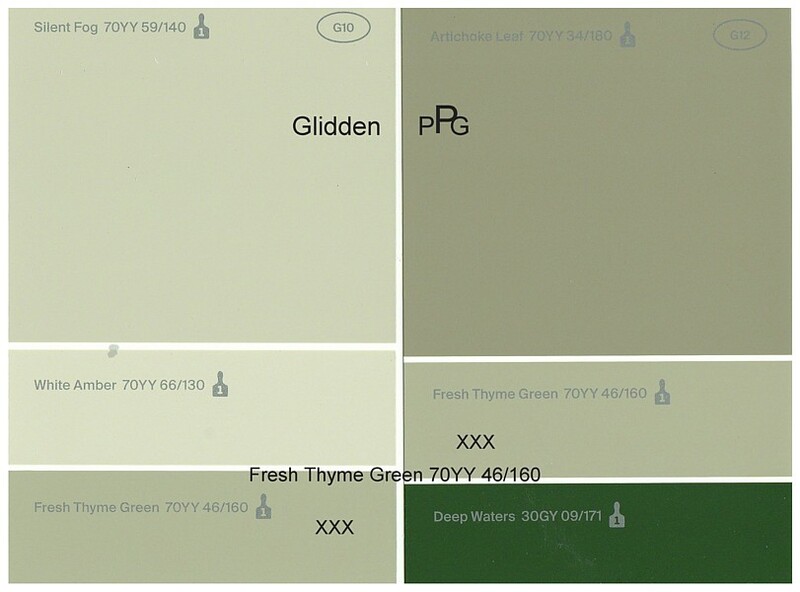 The Color Samples below are from Regular House Paint Color Samples. 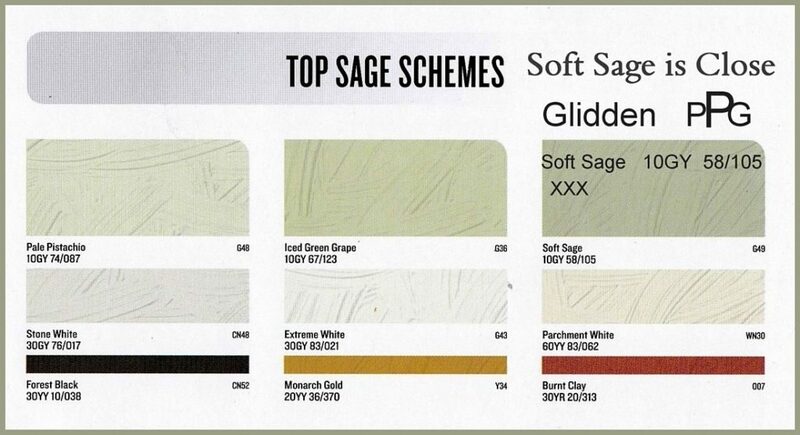 These Files Show the Colors I tried to Match in Craft Acrylic Paints. 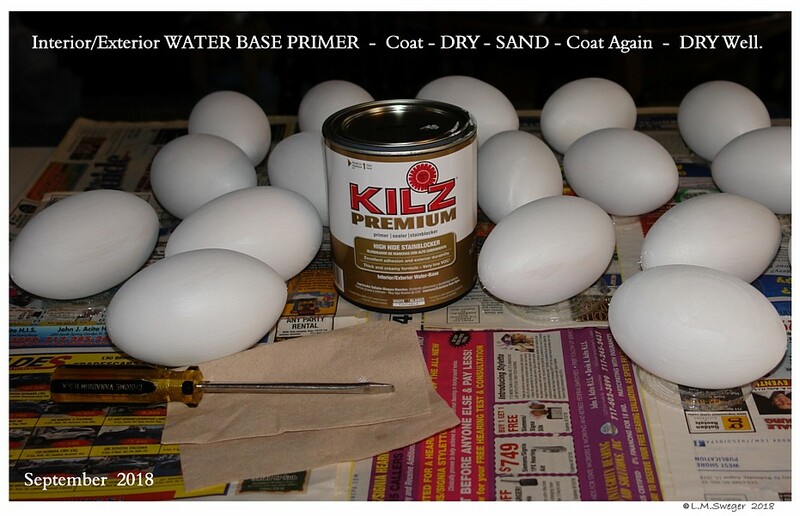 Sand the Bare Eggs until all Rough Spots are Gone. 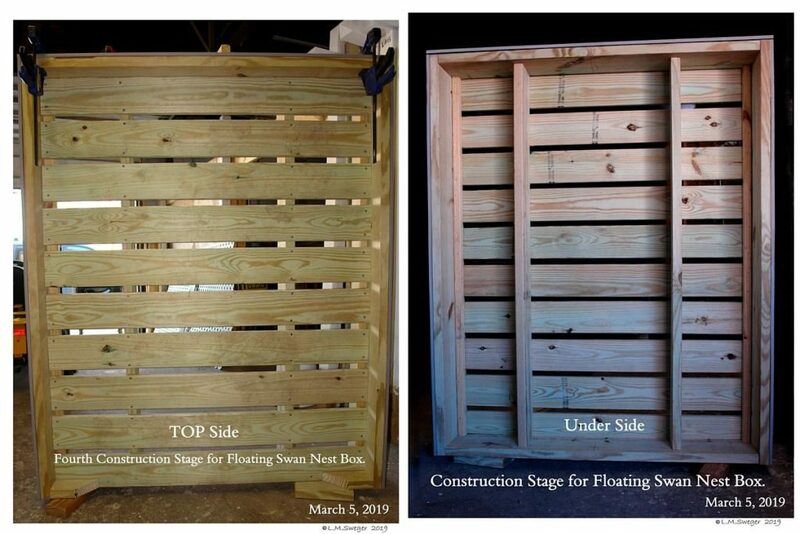 Interior/Exterior Water Base Primer.. 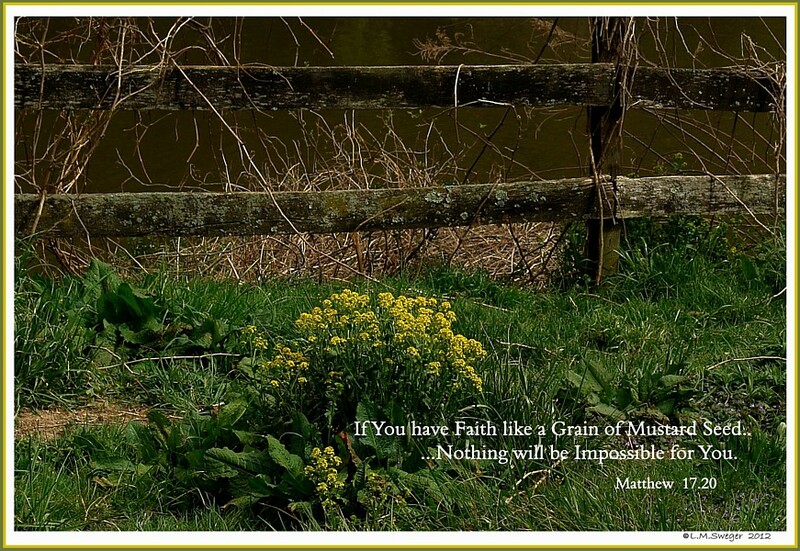 Coat – Dry – Sand. 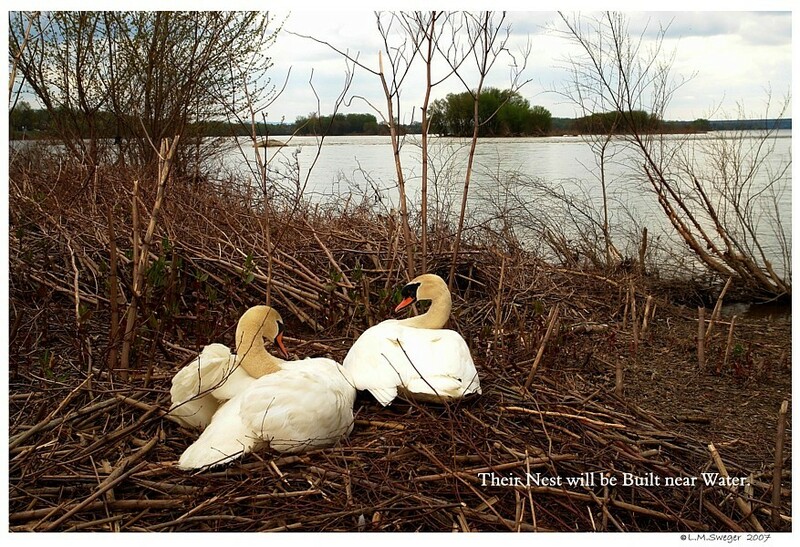 White Coat AGAIN – DRY WELL.. 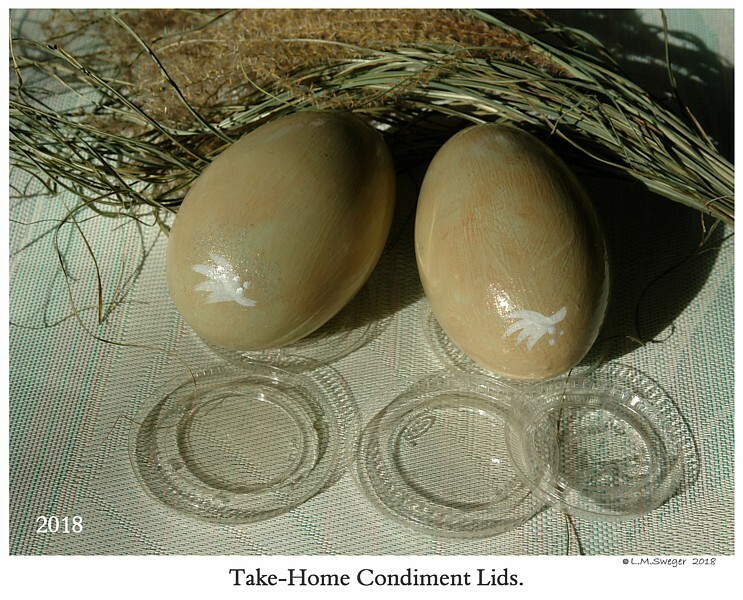 I Used the Little Take Home Container Lids to Keep the Eggs from Rolling. 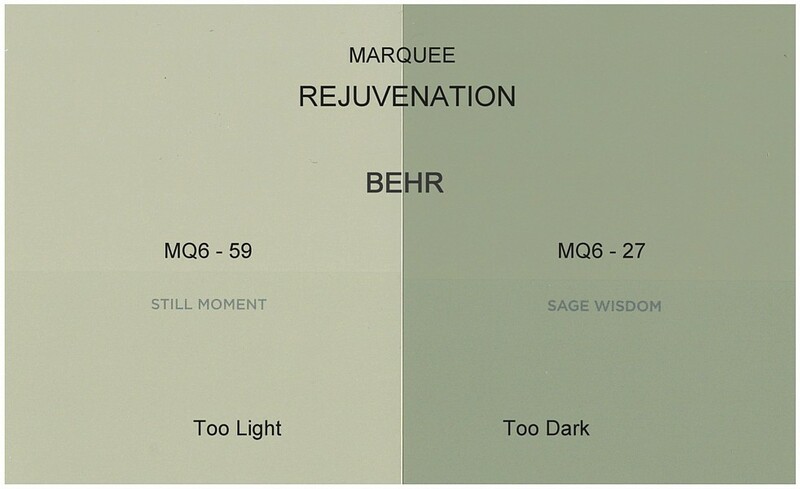 I Added Acrylic Craft Color to Tint an Aliquote of the Sealer. ( NOT Entire Can. ) 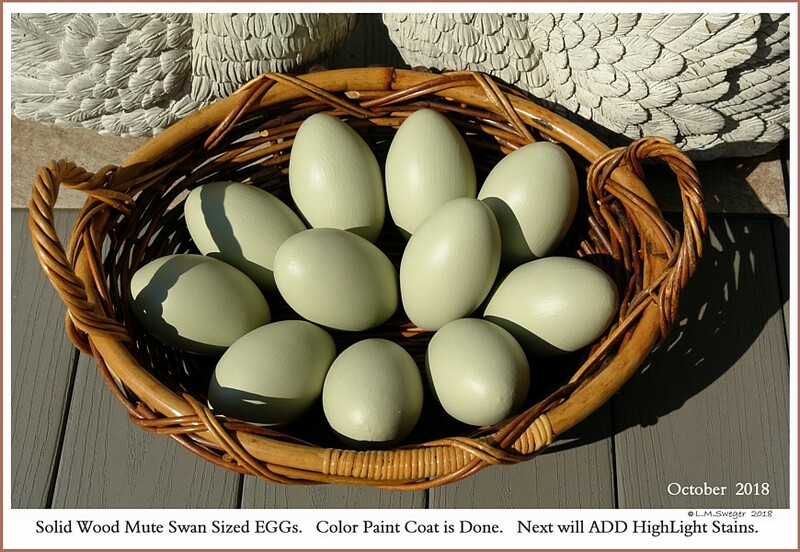 BASE Color Coat Twice..
Time to “Stain” the Eggs. Using Medium Brown Craft Paint. 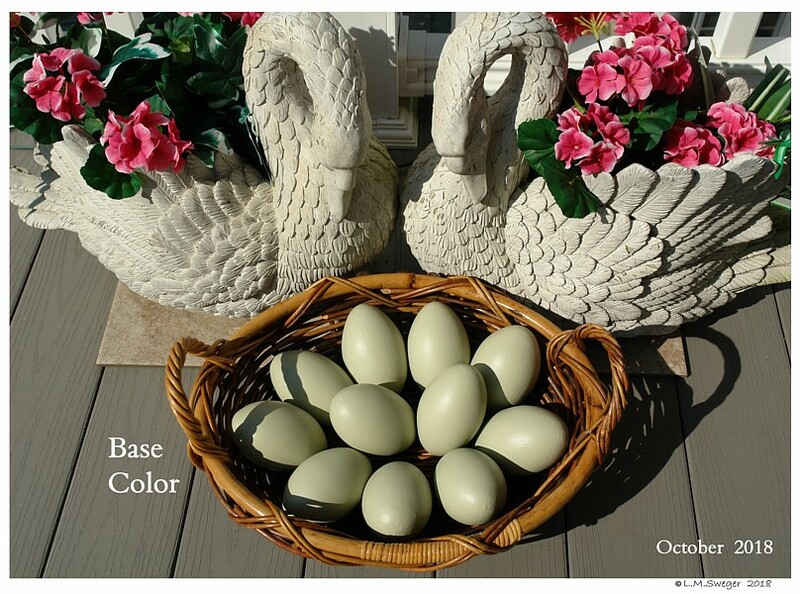 Dilute the Color until it will Stripe and Smear on the Egg. 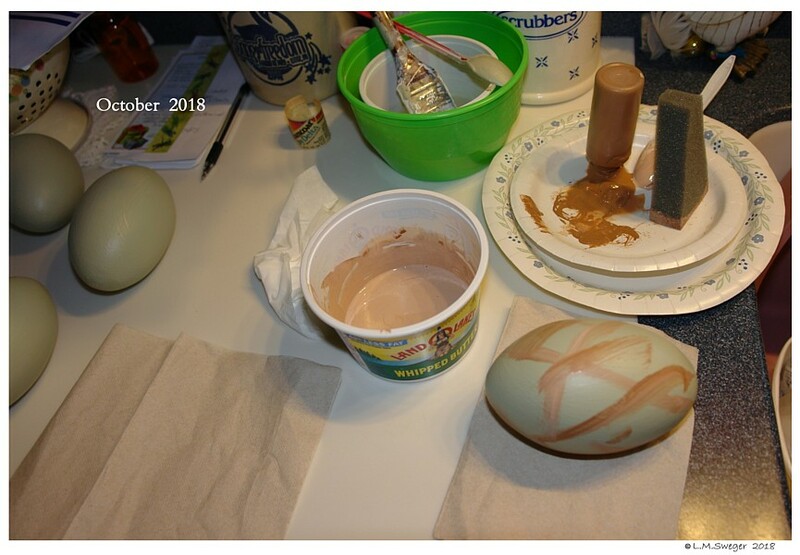 I had to Wet my Hands to Coat the Entire Egg with Uneven Coloring. Then WIPE Dry with a Paper Towel to Remove MOST Paint. It should have an Uneven Mottled Pattern. 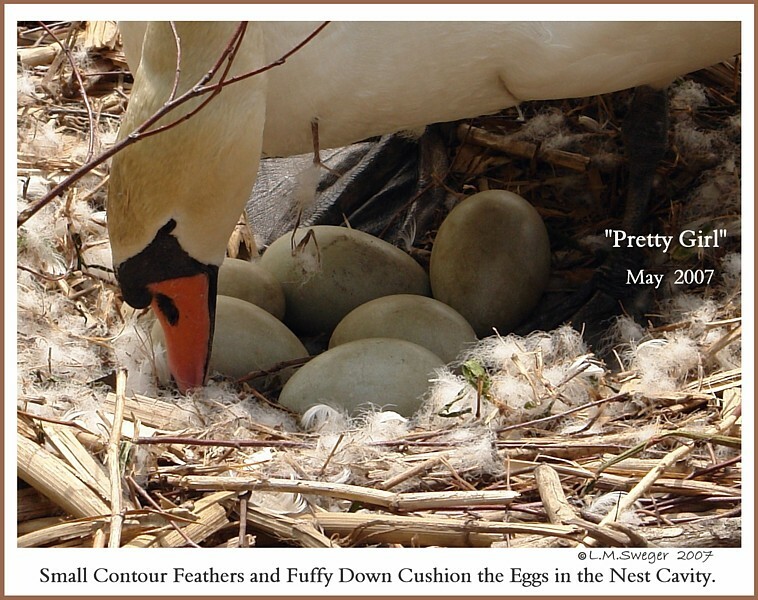 There is a Fluff of Small Feathers in the Swan’s Nest to Cushion the Eggs. 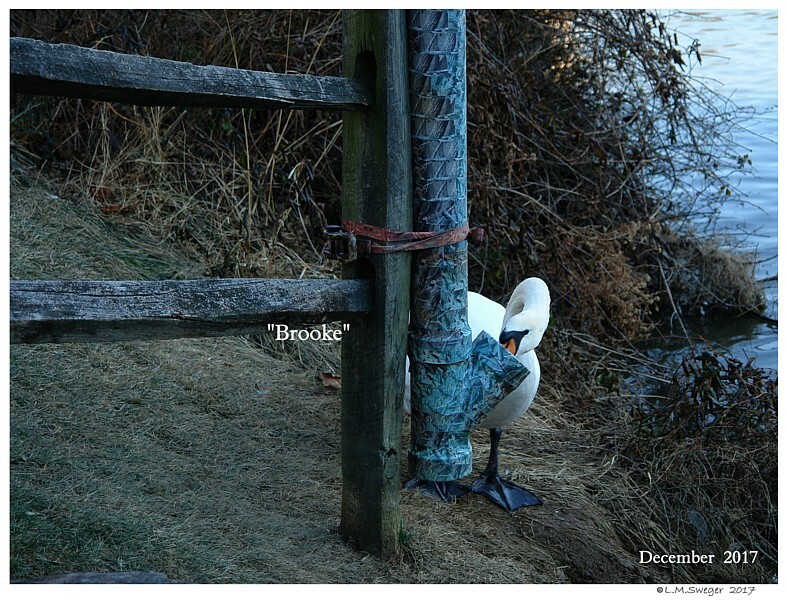 I Painted to Small SemiPlume Feather on One End..
To be Sure Which are REAL Which are Wooden. 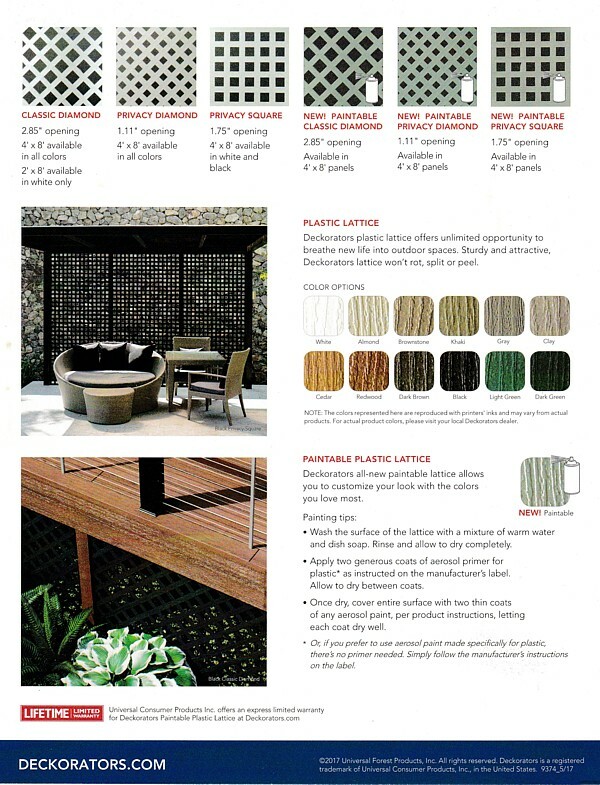 with the SATIN Exterior Seal & Protect Finish. 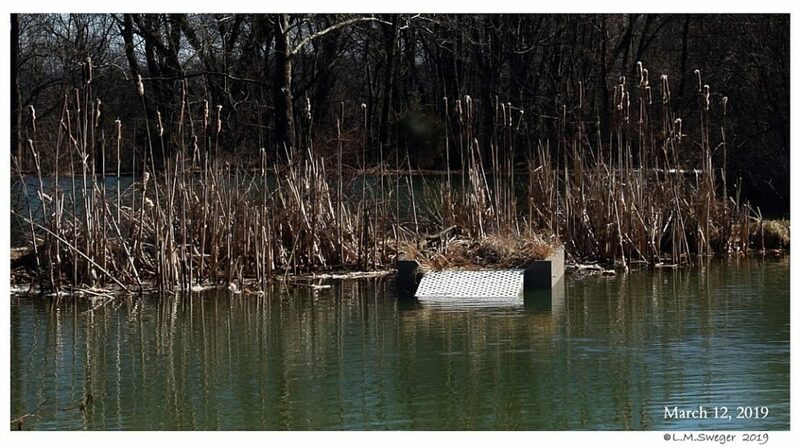 DRY Well. 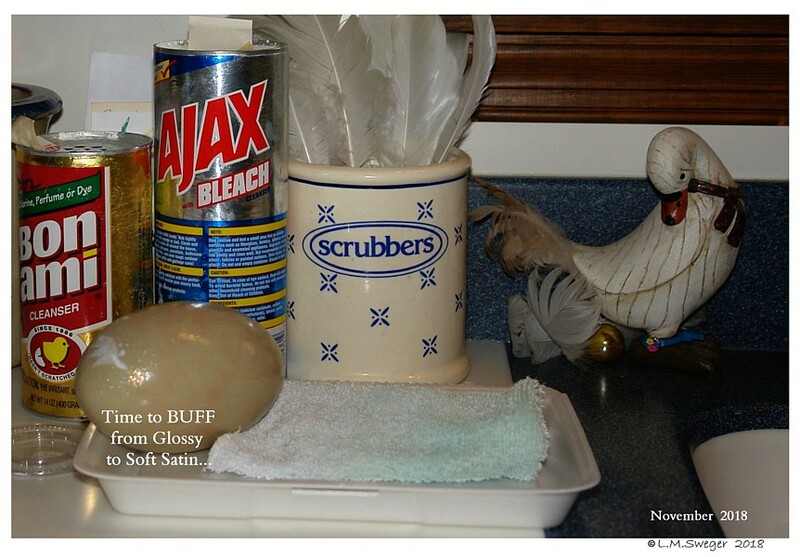 I Generously Sprinkled Fine Grit Bon-Ami & Coarser Ajax Scouring Powder. 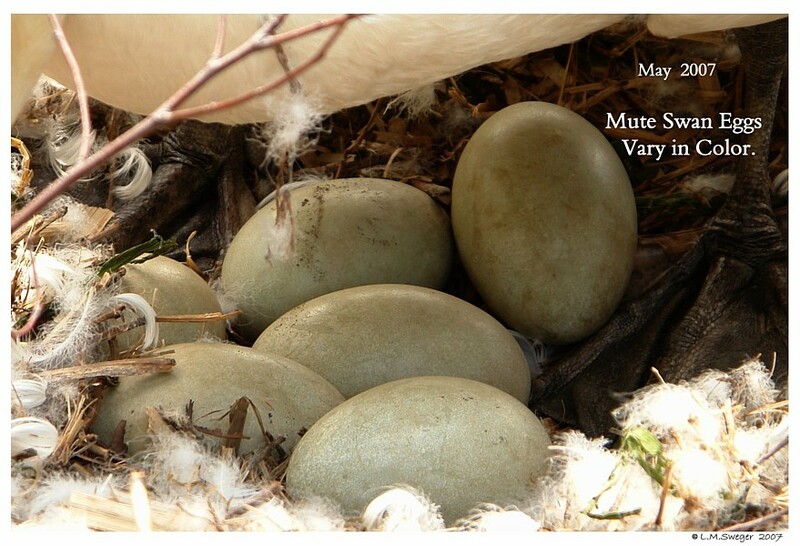 Generally Rubbing-Buffing all over until the Eggs had the Same Dull Surface as the Real Mute Swan Eggs. RINSE Well, Dry Immediately. 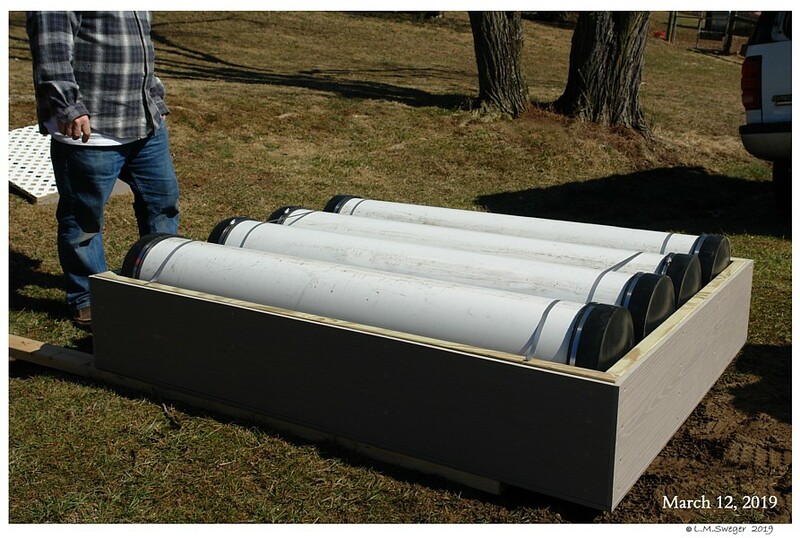 Dry Well before Storing. 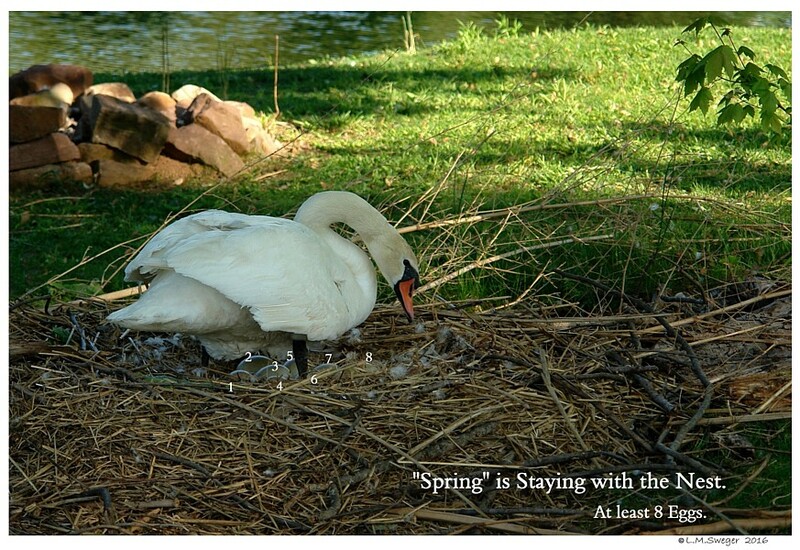 After using in a Spring Nest, DO NOT SOAK IN WATER. Wipe with Soapy Water, Rinse, Dry Well. Store for Next Year. 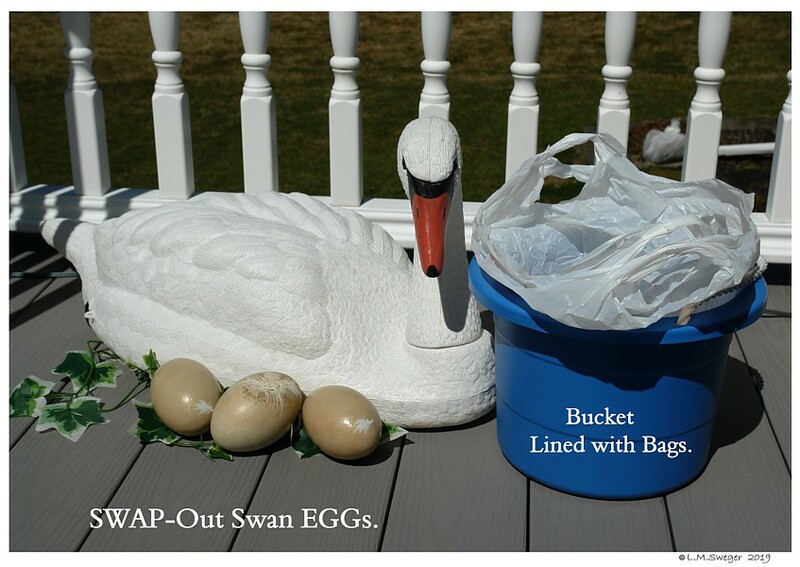 How to SWAP-OUT Swan Replacement Eggs. 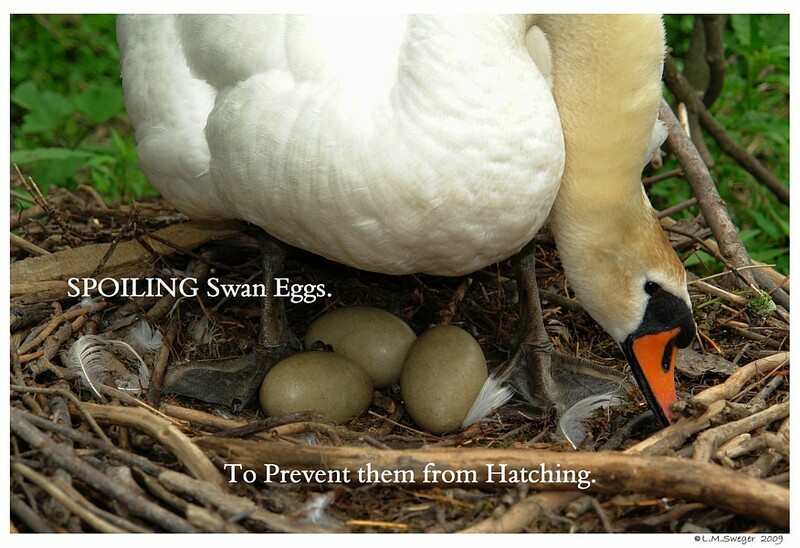 IF your Goal is to Prevent ALL EGGs Hatching. 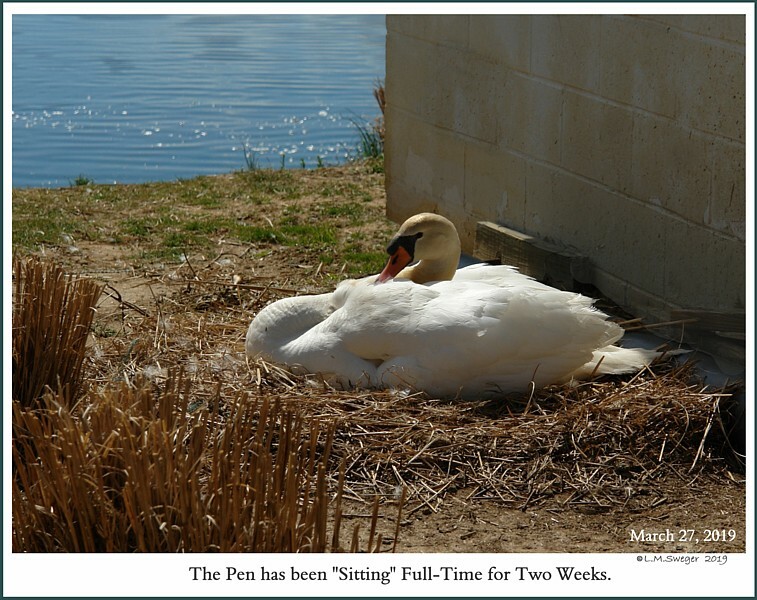 NOTE: When the Swan Pen Starts to “Sit” Full-Time. 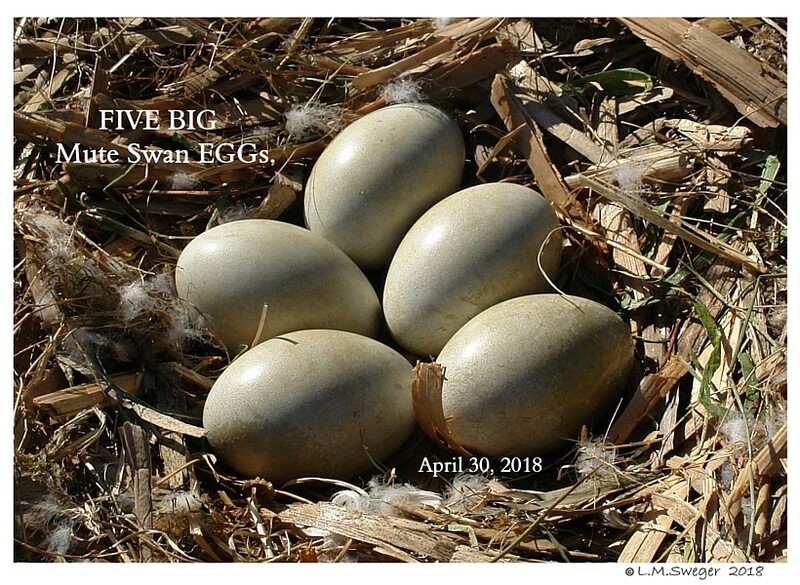 Mark Your Calendar. 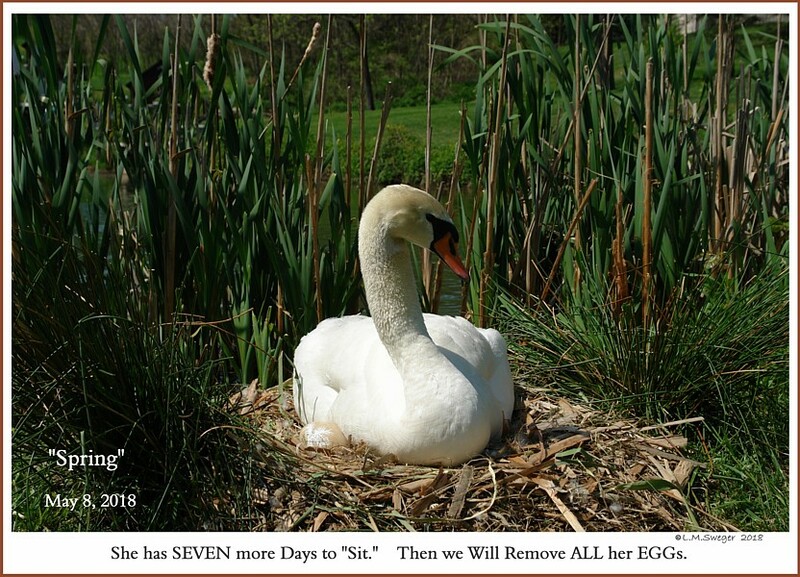 She Needs to “Sit” for 42 Days. 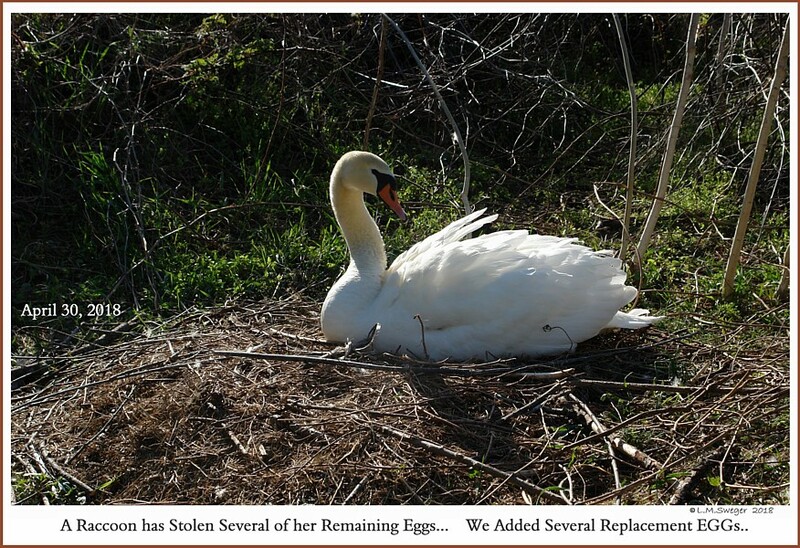 OR IF she Abandon her Eggs on her own. 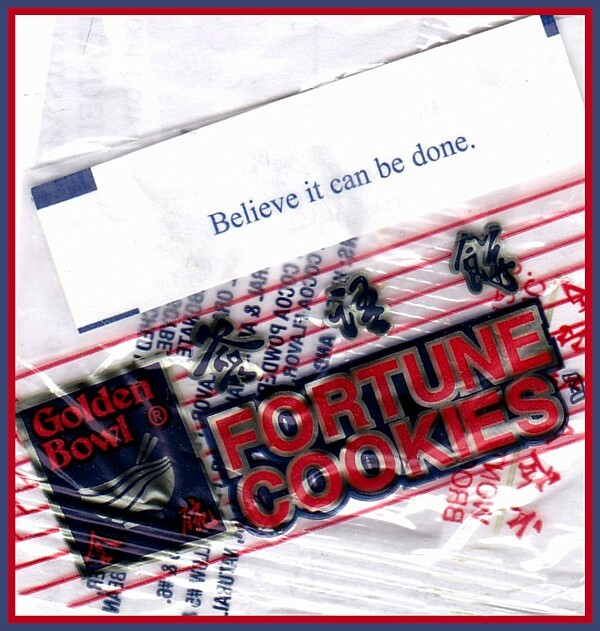 Then Watch for Recycling. 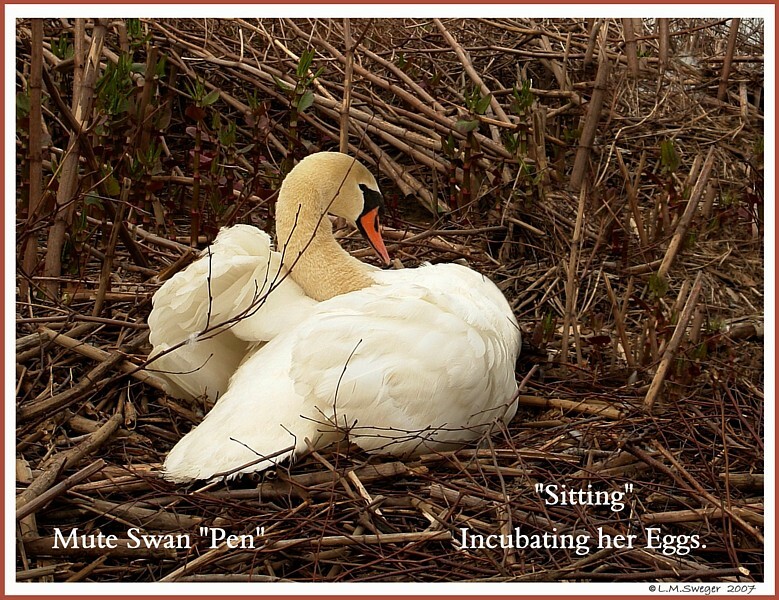 To Ensure she is Truly Finished Laying..
Be Sure it is the Pen at the Nest “Sitting” Full-Time. 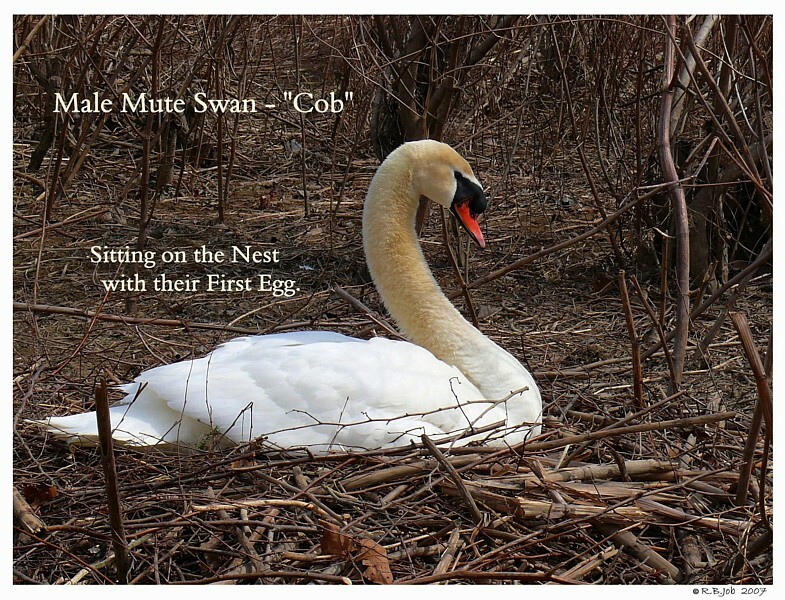 Most Cobs will Sit with the Clutch as it is being Laid. 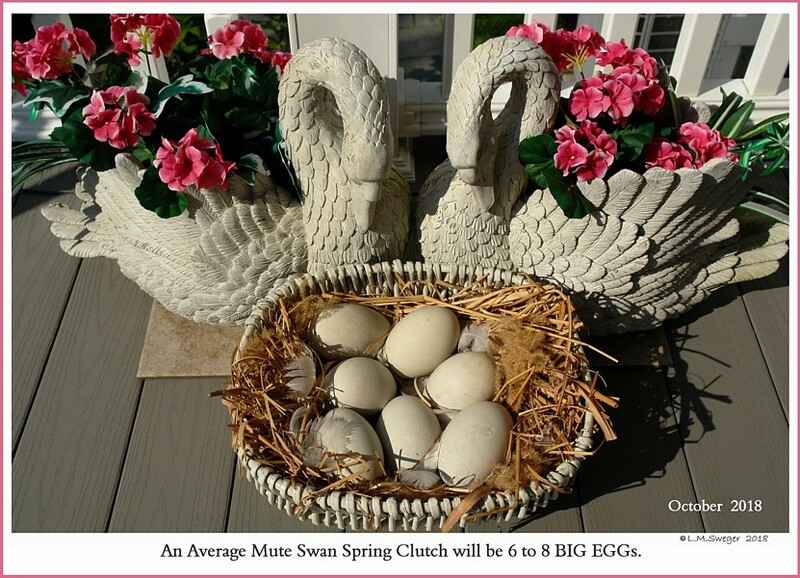 For a Clutch of 5 Eggs it will take 9 Days. 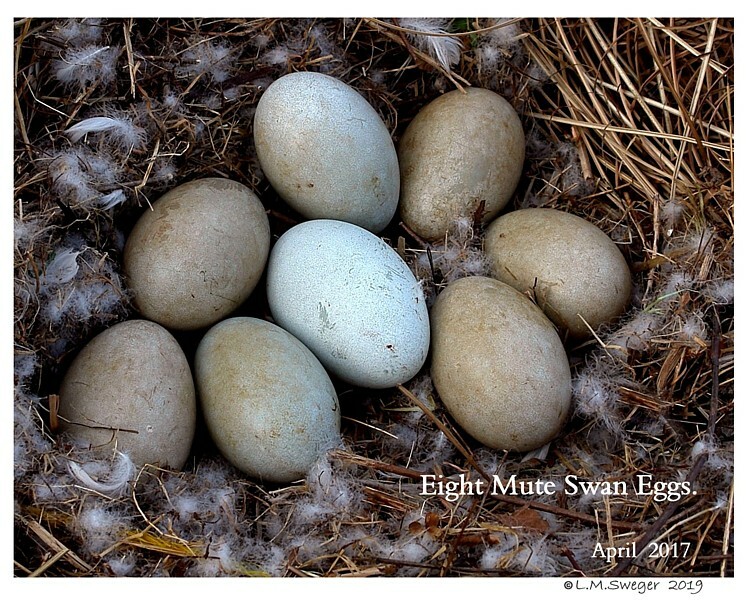 For 8 Eggs 15 Days. 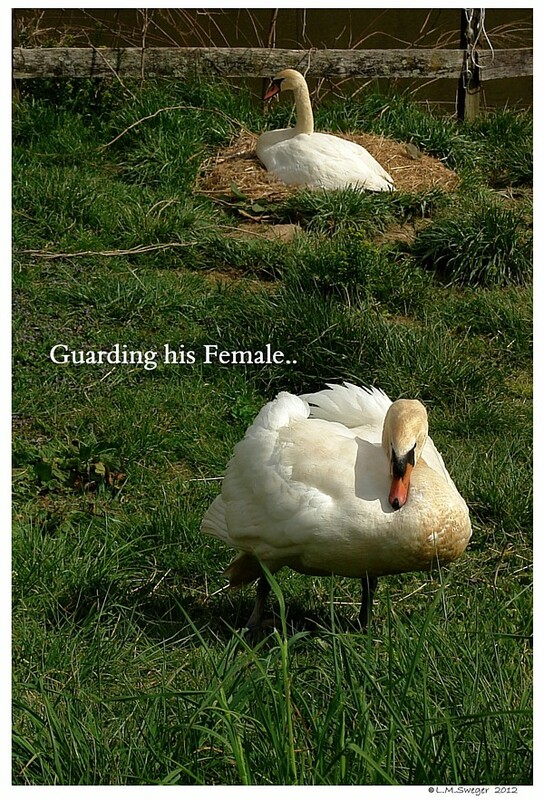 He will Protect the Eggs, but he CAN NOT Incubate them. 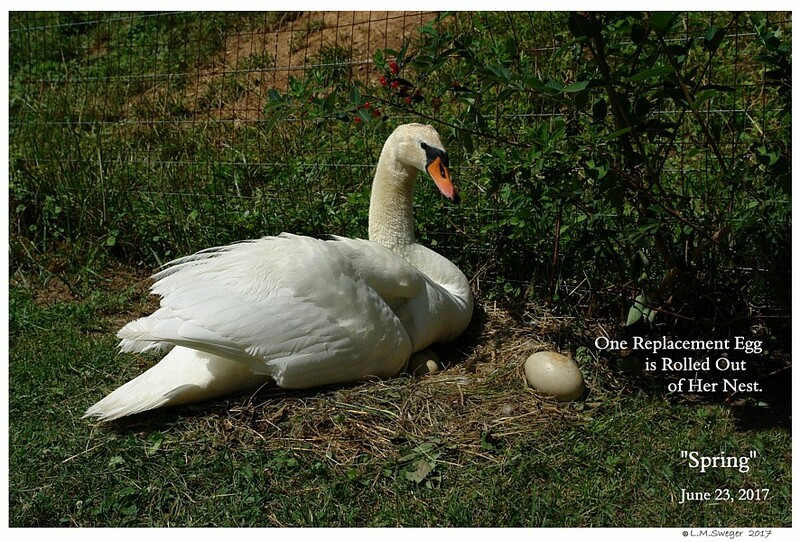 Only the Pen can Incubate the Eggs… ALL Eggs at the Same Time. 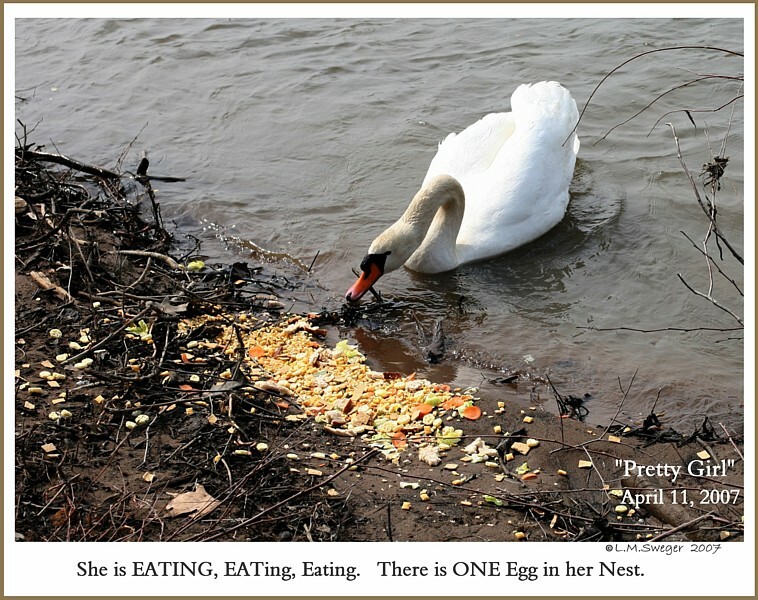 During the 8 to 17 Days the Female is Laying her Eggs, she is EATING. 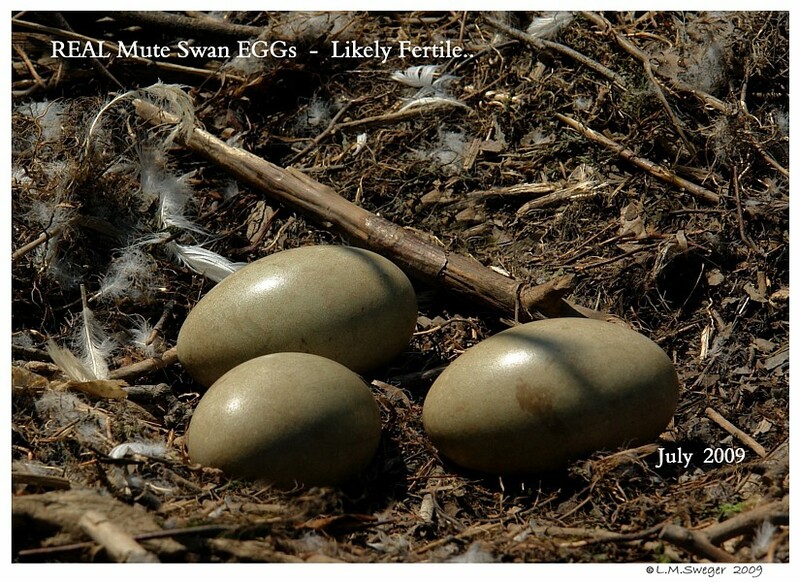 Fertile Mute Swan Eggs SHOULD Hatch on Day 37 Plus – Minus 1 Day. 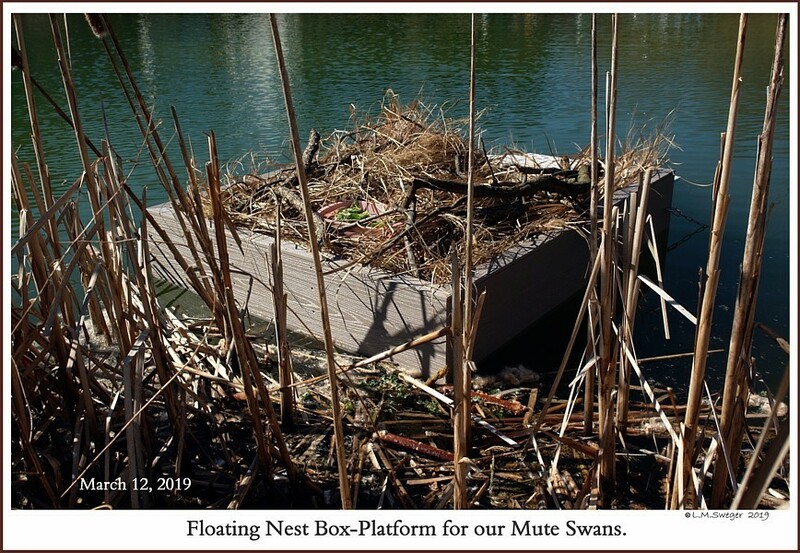 It is an Interesting Time. 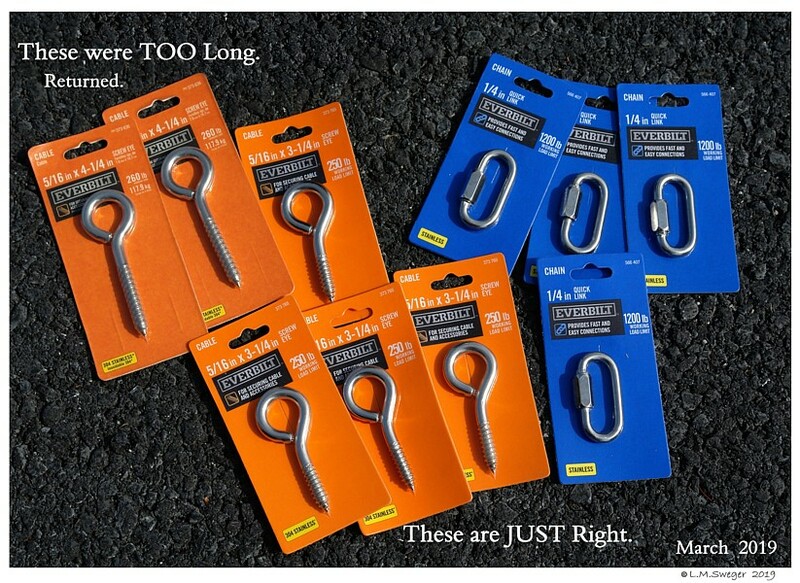 But, a Lot Like Watching Paint Dry. 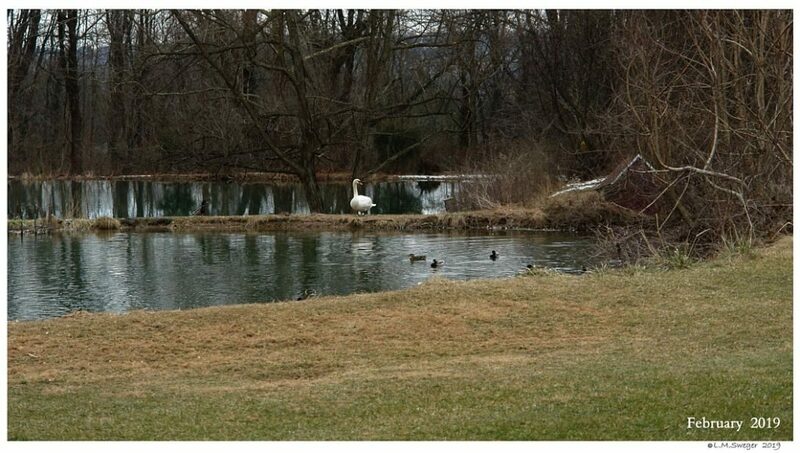 Quick Breaks on the Pond to Drink and Relieve herself. Average 6 Minutes. 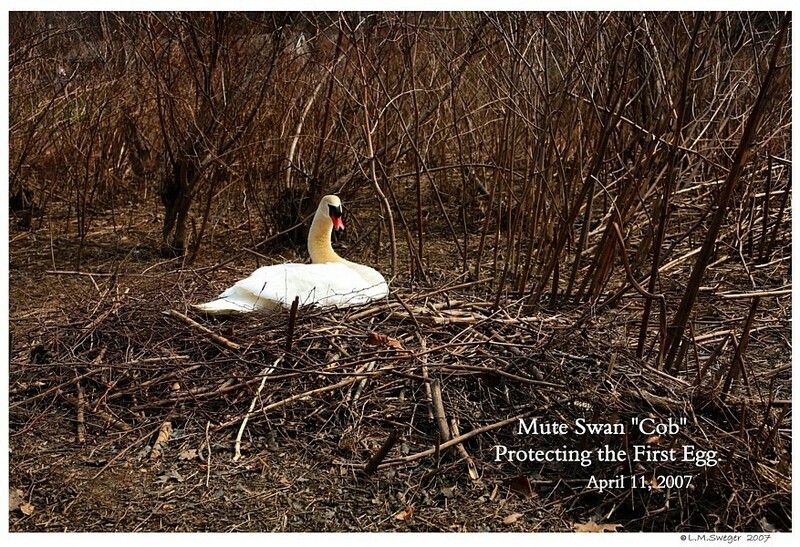 Most Cobs will Watch the Nest during this Time. Not All. 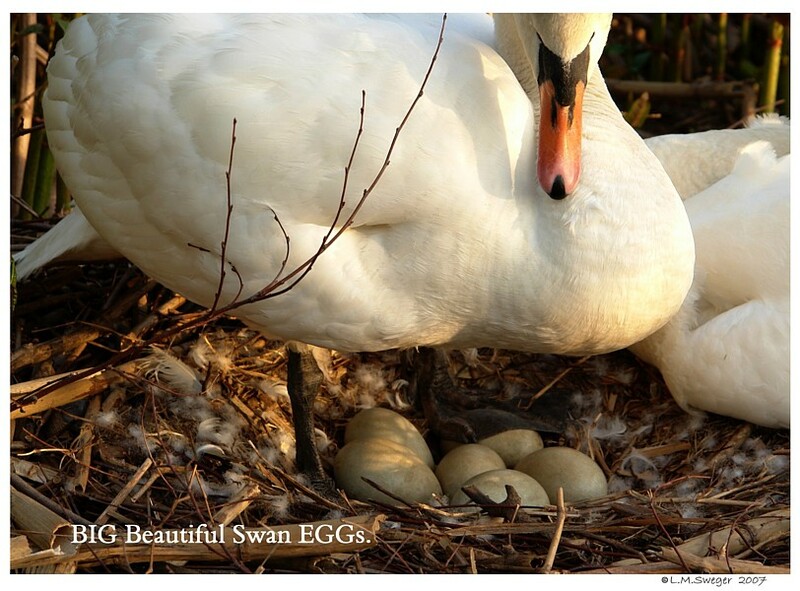 If the Eggs are Fertile on Day 35 the Cygnets inside the Shell start to Wiggle. 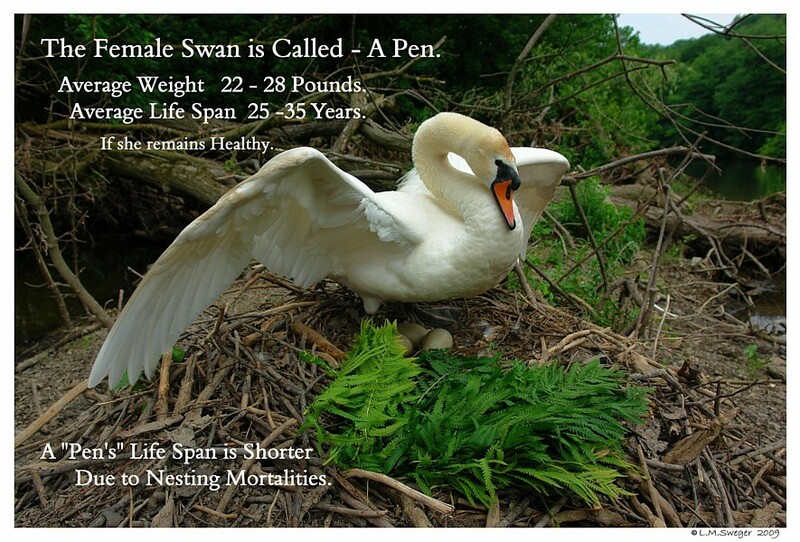 The Pen will be OFF and ON the Nest Frequently.. STARTING to EAT ! 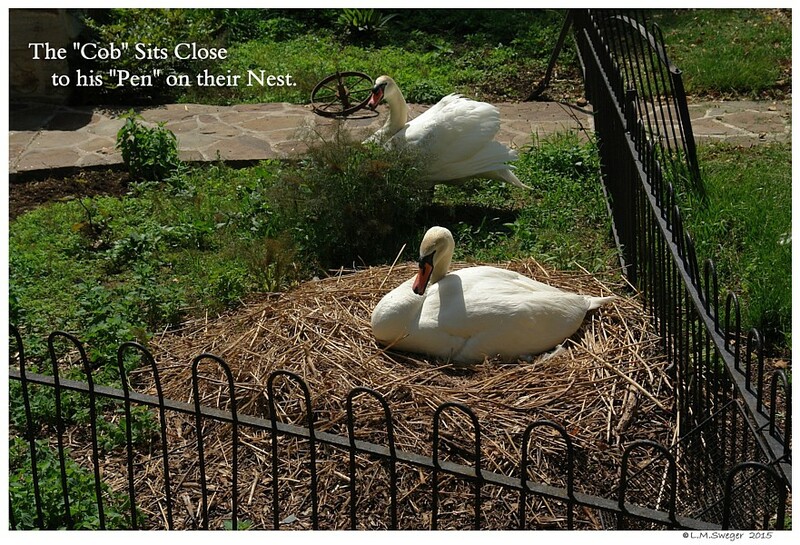 The Pen’s Hungry Behavior is a VISUAL SIGNAL Hatching is about to Happen. 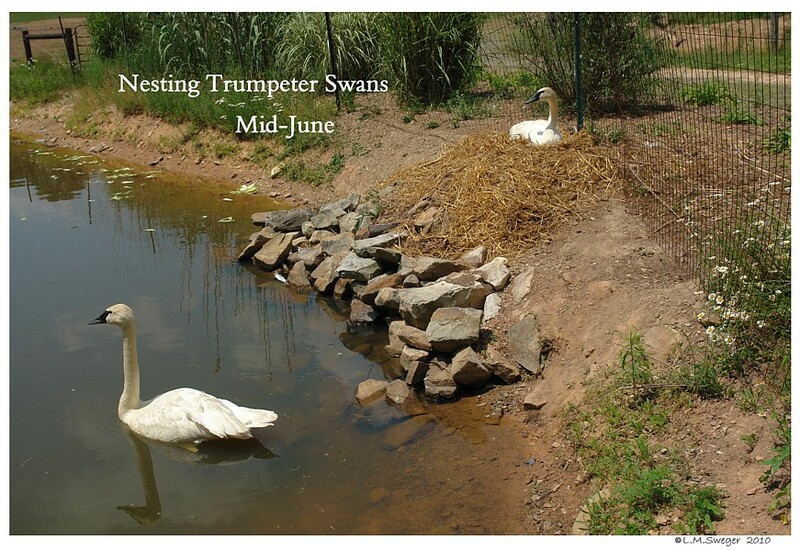 The Cygnets are Pipping. 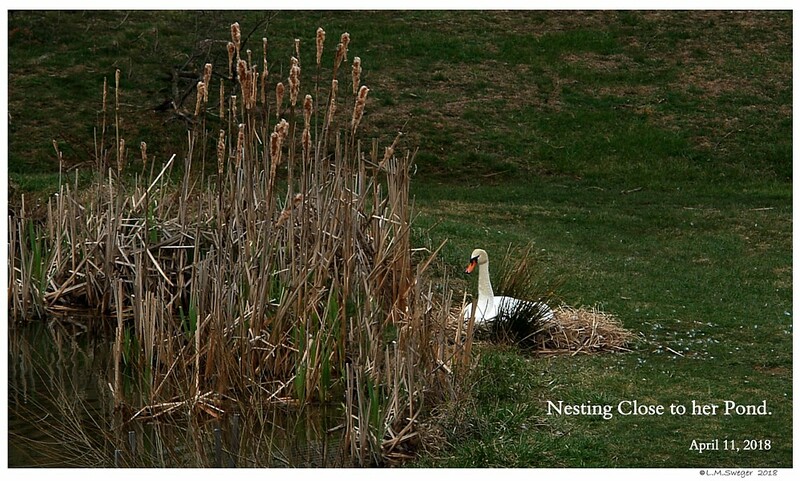 IF you can safely get Close you can hear them. 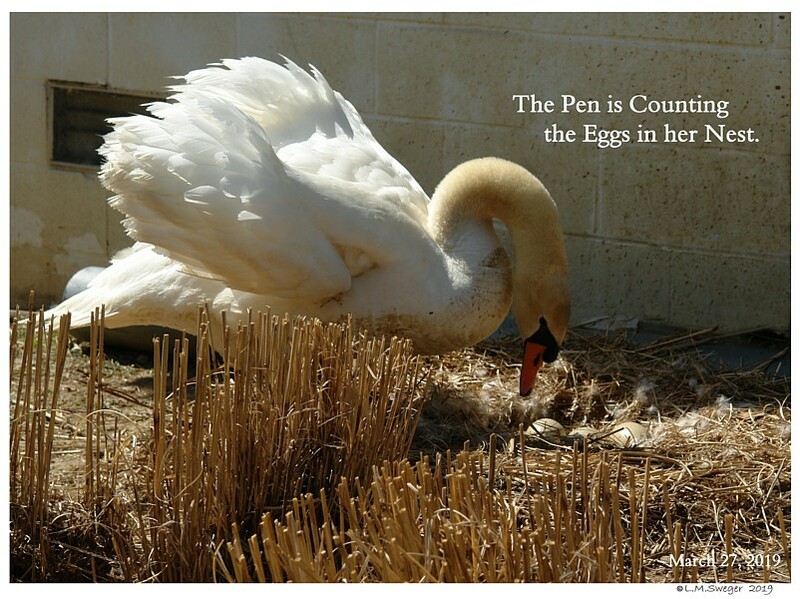 If the Eggs are Spoiled or Replaced, the Pen will not have this Signal. 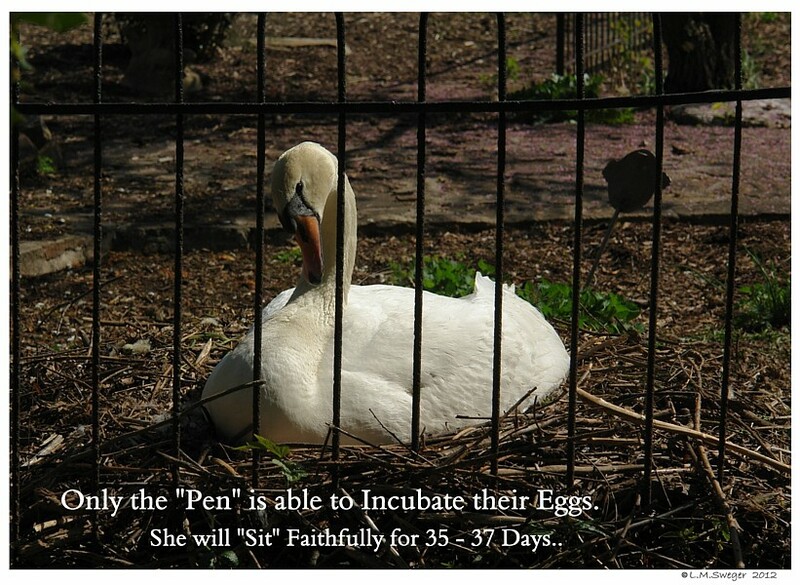 She will continue to “Sit.” If the Eggs are not Removed some Pens Starve to Death. 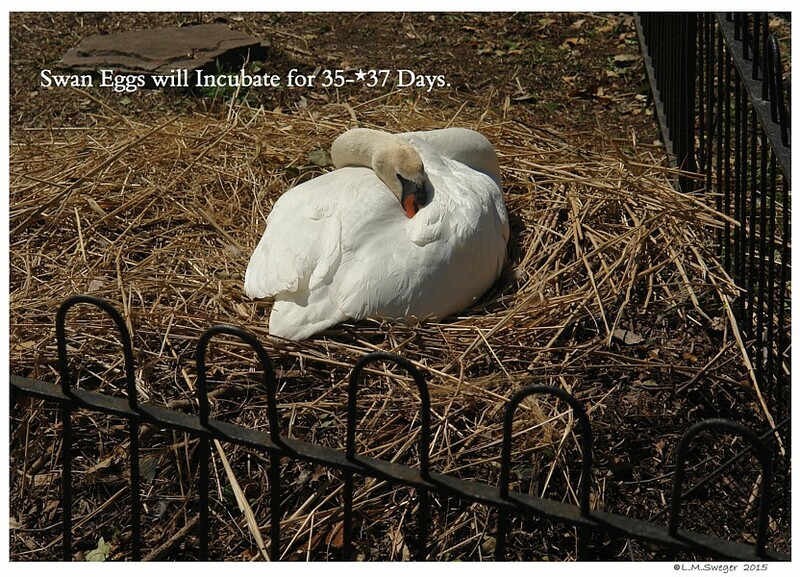 It is for her Health and Safety, REMOVE all Eggs at 42 Days. 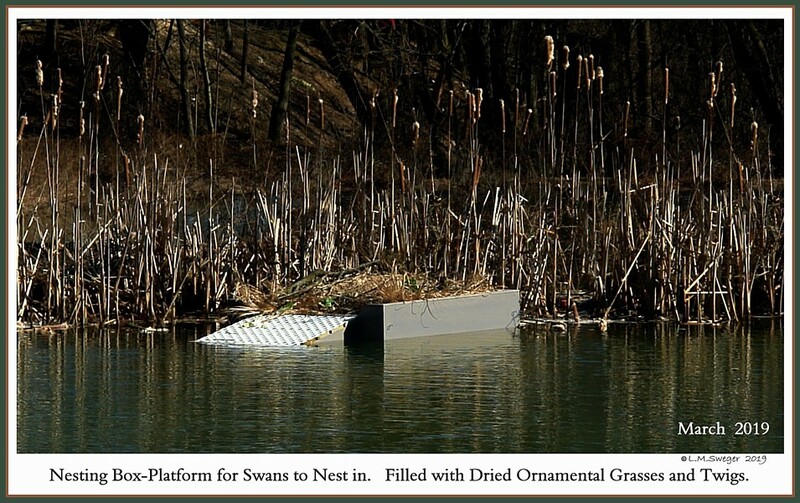 Arrange for 3 People to Help with this Project. 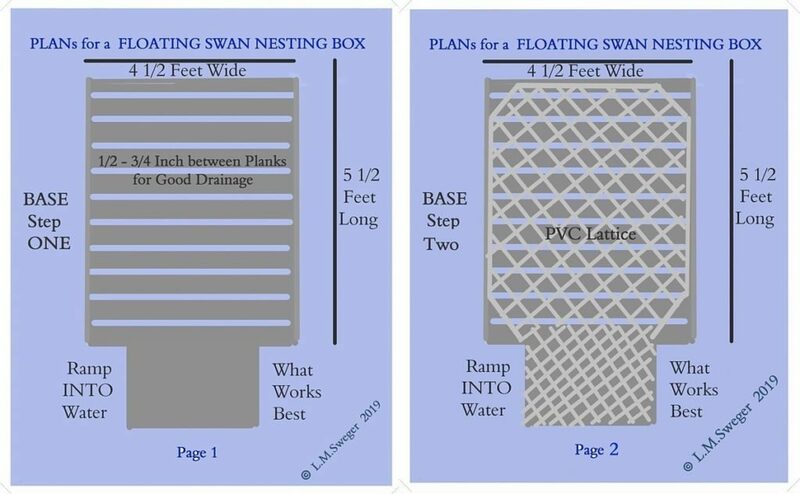 Supplies.. One or Two Large Nets.. Maybe a Large Towel..
A Bucket Lined with Two Plastic Grocery Bags. Working Together this will only take a few Minutes. 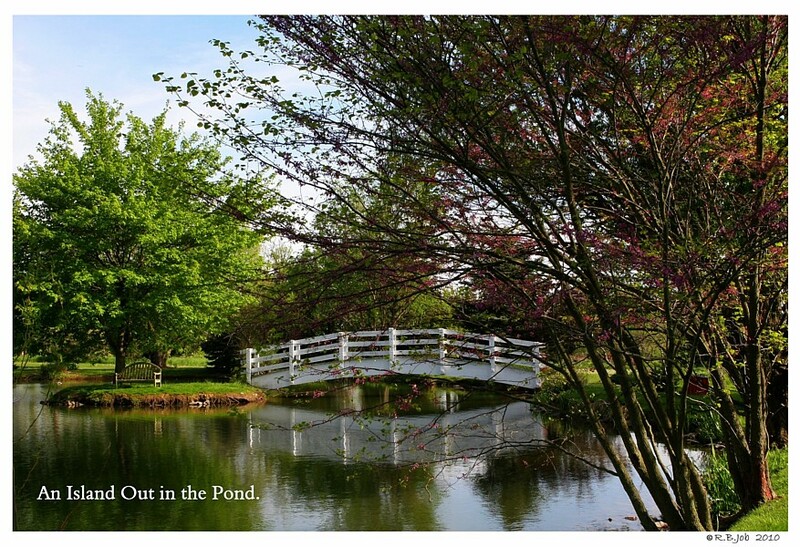 Either keep him at a Safe Distance across the Pond. 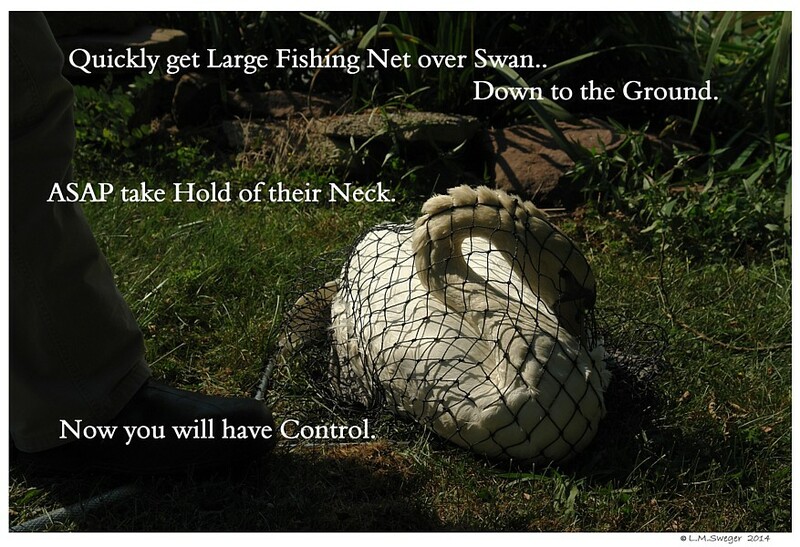 OR when he come up to the Nest AFTER YOU – Net him. 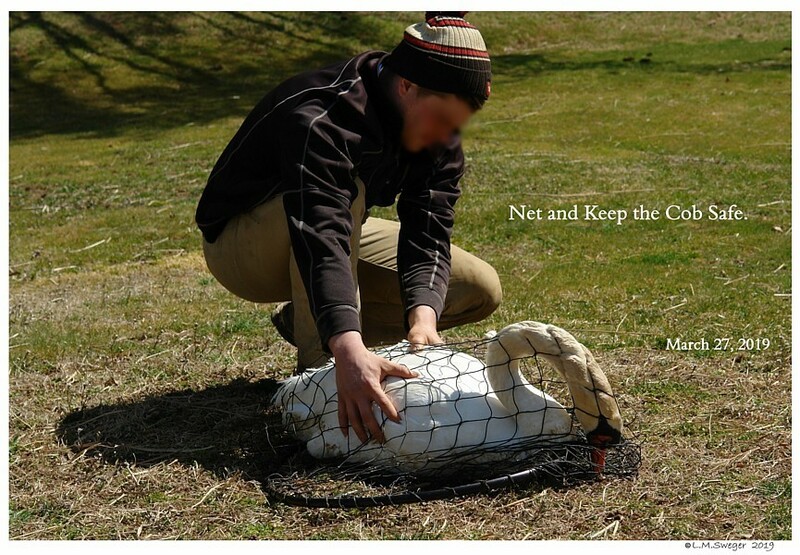 SECOND: Net the Pen Or Wrap her with a Large Towel. Move her off to the Side. 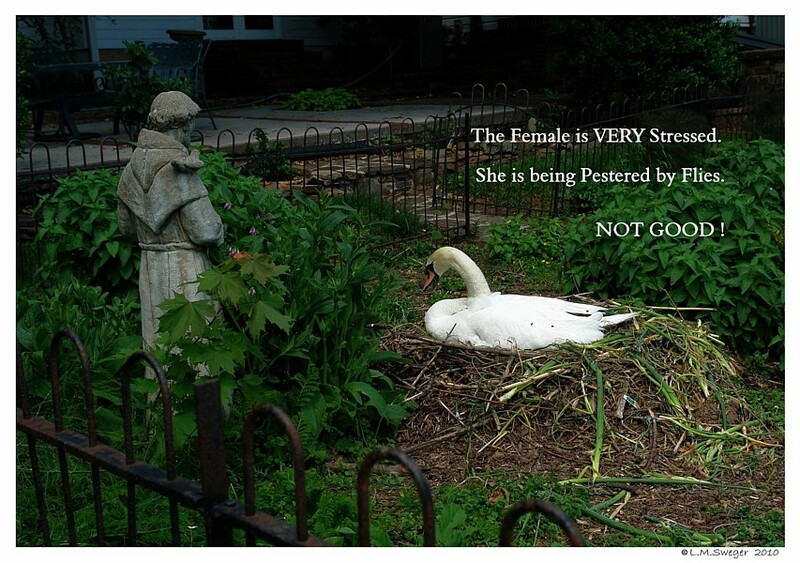 Try NOT to Scare Her. 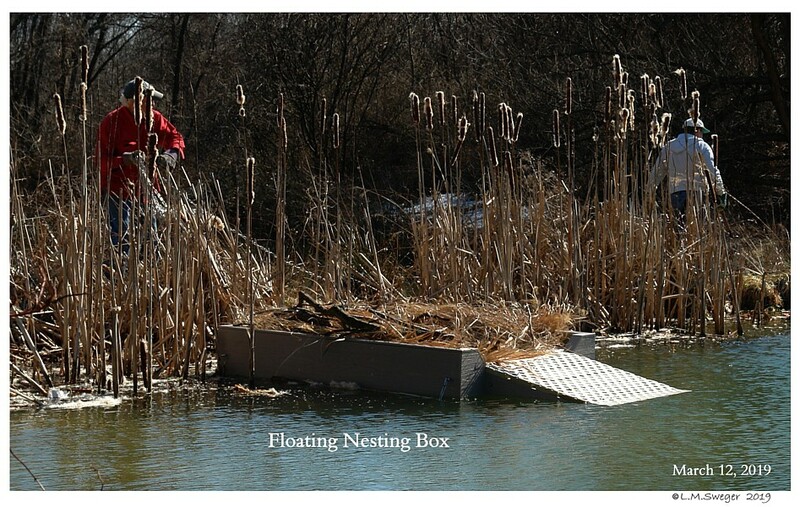 OR Encourage the Pen off her Nest and into the Pond. 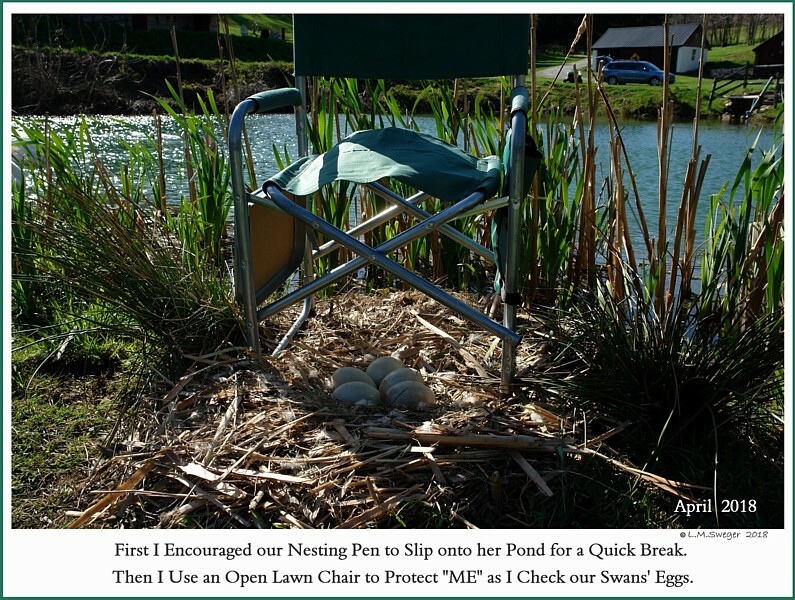 I use a Lawn Chair to Encourage the Female off her Nest. Turned Around this Also Protects me from being Whacked. 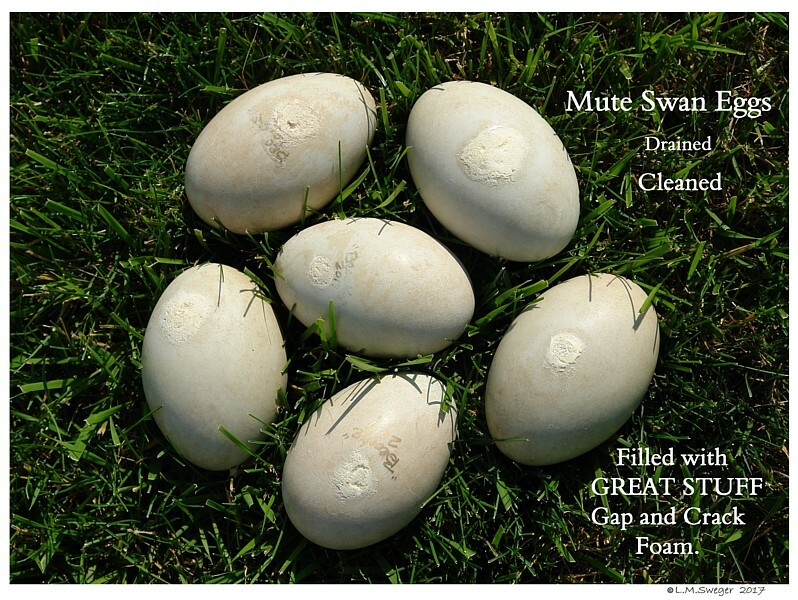 Check for any Cracked or Smelly Eggs that are Attracting Flies. This Female became VERY Sick from Eating the Pesty Flies. 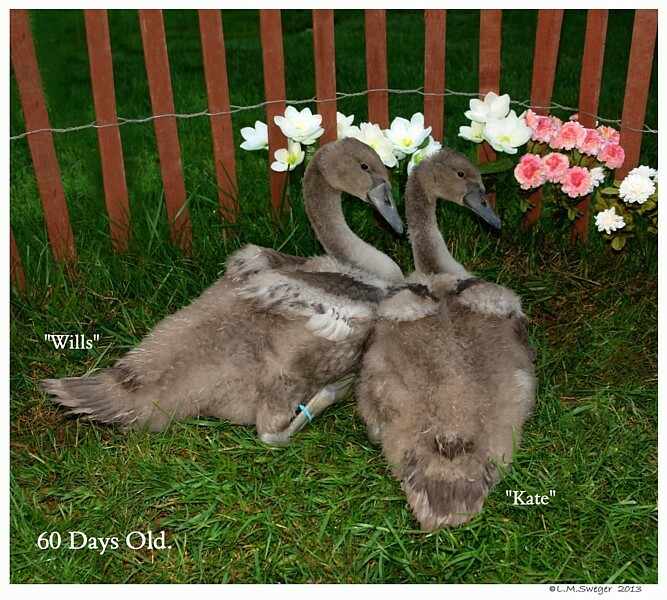 She died Nine Days after Hatching her Only Cygnet. 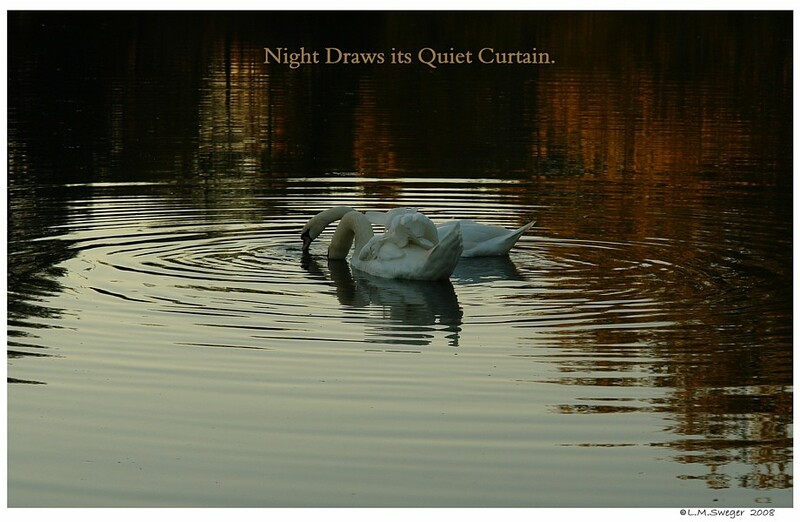 Then it Disappeared. 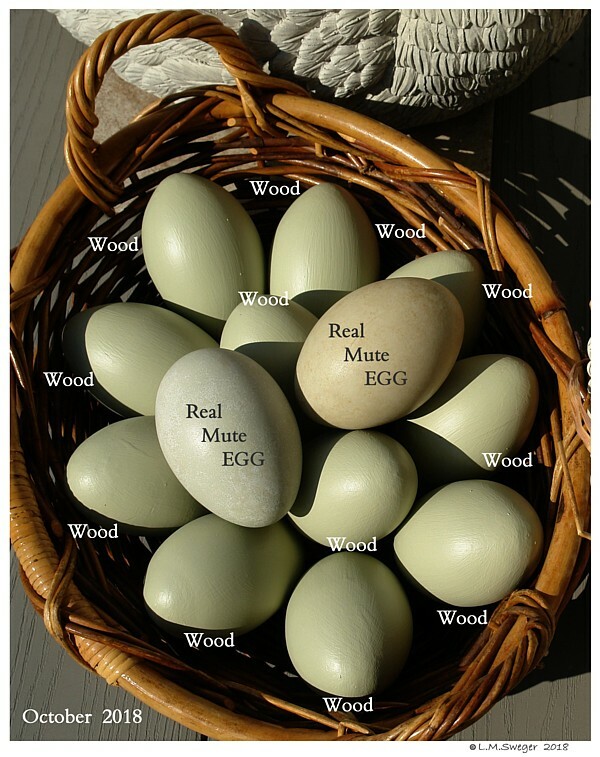 Remove ALL but Two Real Eggs that are OK.
Place only THREE Wooden Replacement Eggs in the Nest. Release the Pen. 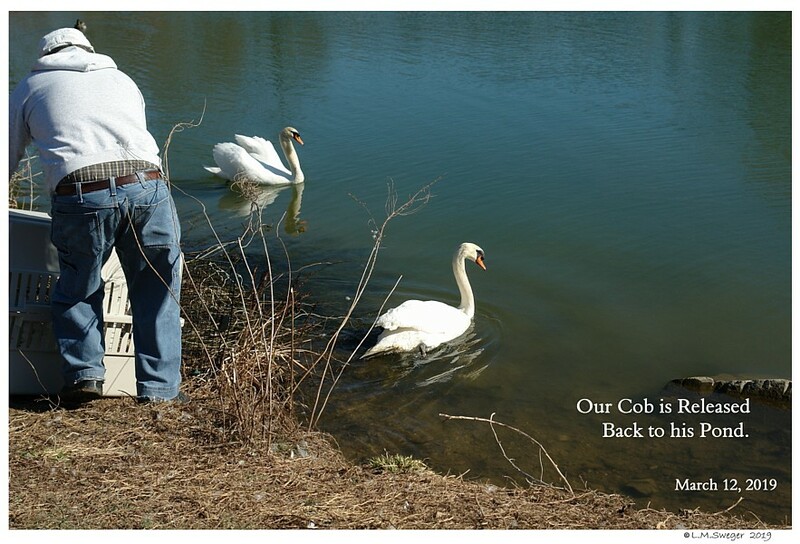 Then Release the Cob. 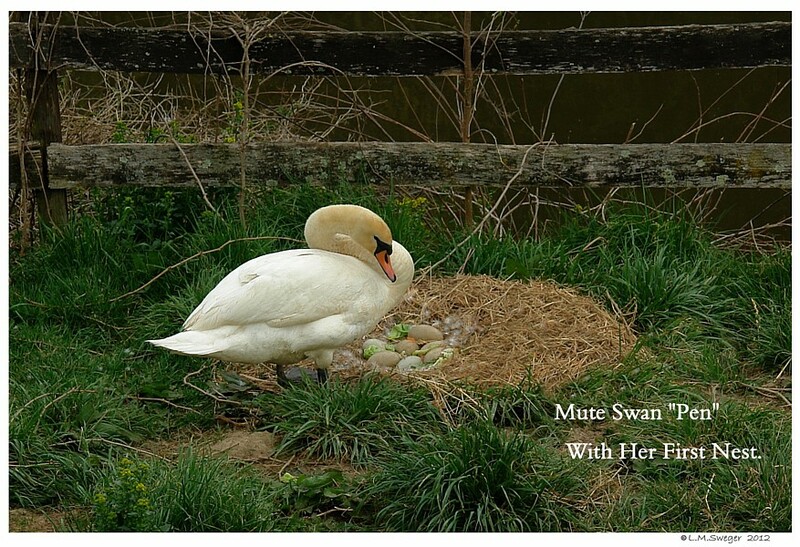 Check the Swans are OK..
to the Eggs in her Nest. 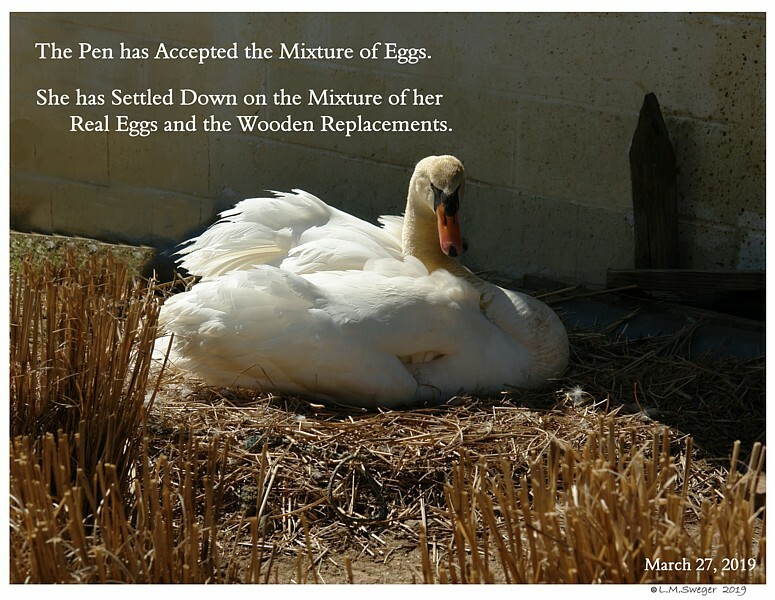 That she Accepts the Replacements. – KEEP in Plastic Bags. 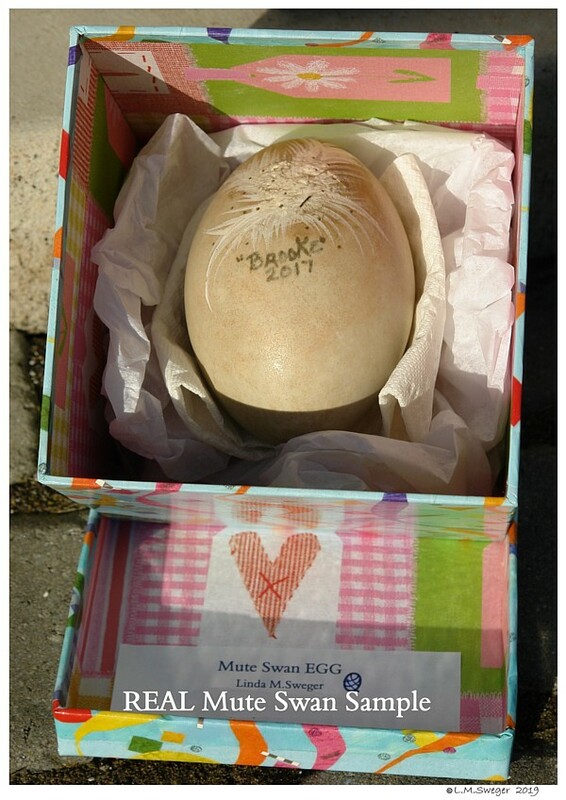 I had ONE Stinky Egg that I placed in the Bucket Bags. 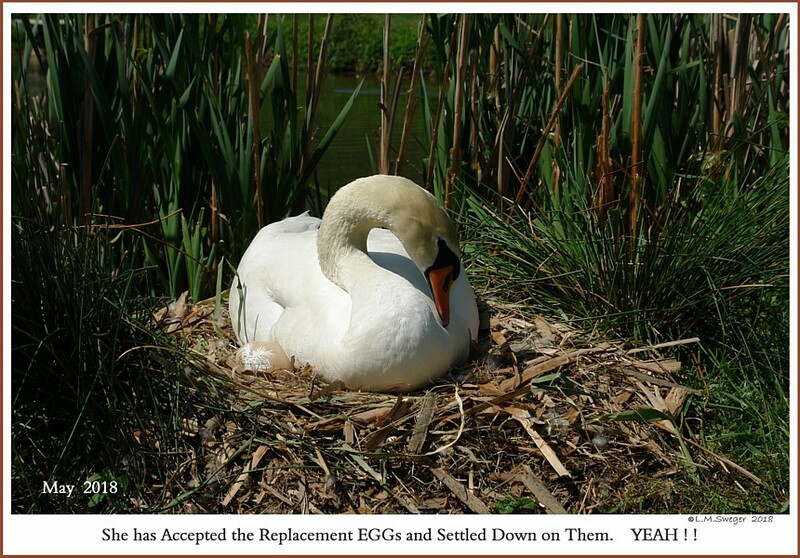 Put the Replacement Eggs in the Nest. 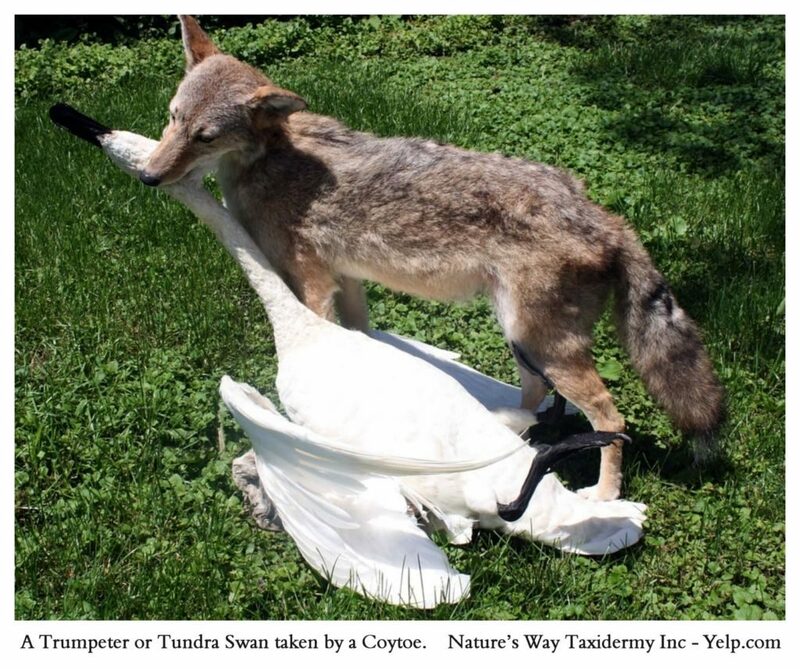 Stood Up. Picked up my Bucket. BOOM !!! ONE Egg was that Close to Exploding under our Pen. 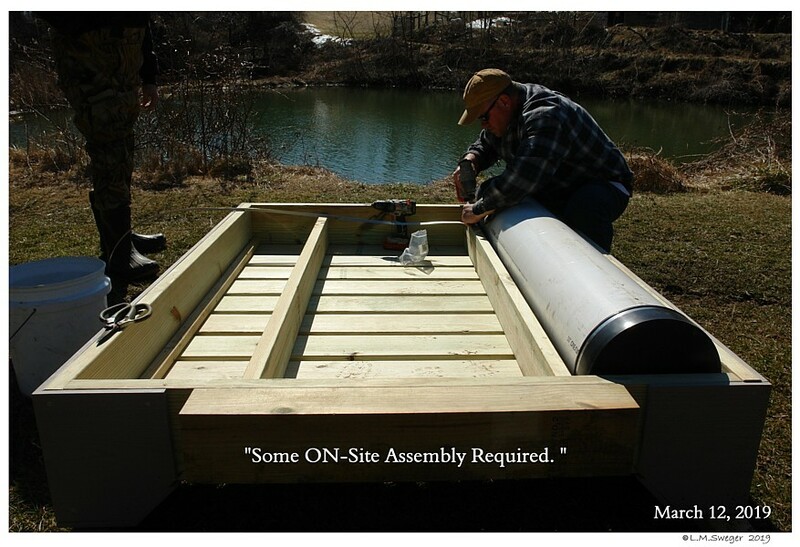 &&&&&&&&&&& TURN CARD OVER… MORE INSTRUCTIONs. 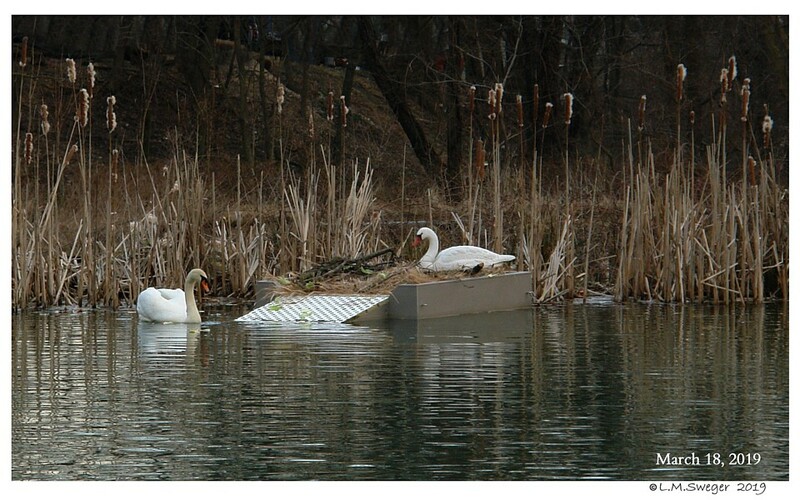 that the Swans are still in Normal Nesting Behavior Mode. 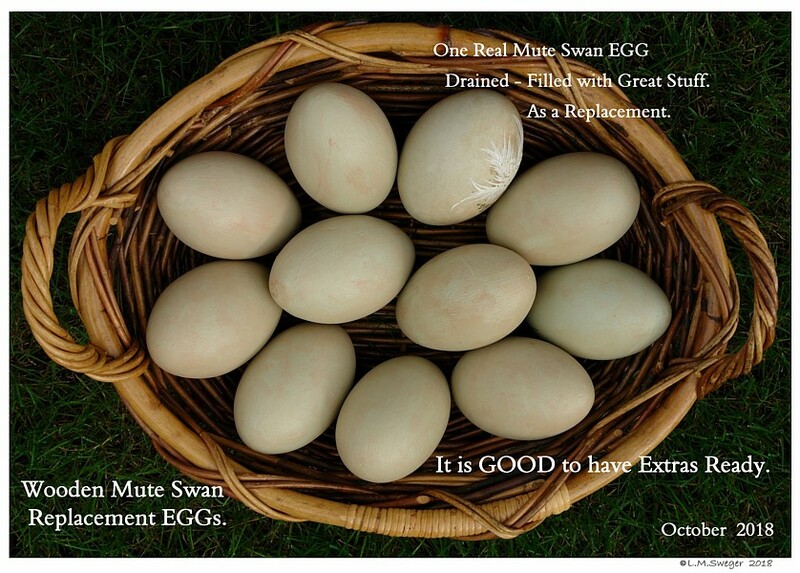 Repeat: Remove the Remaining Real Eggs. 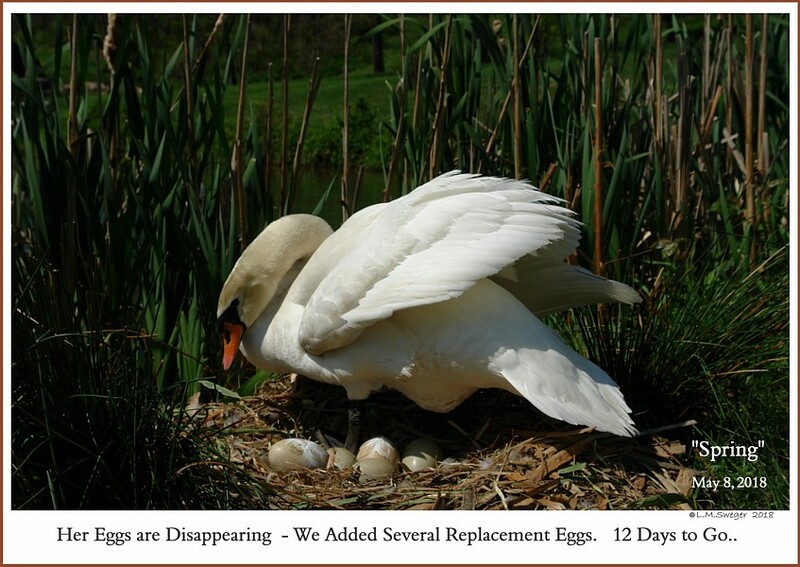 DO NOT Add any more Replacements. 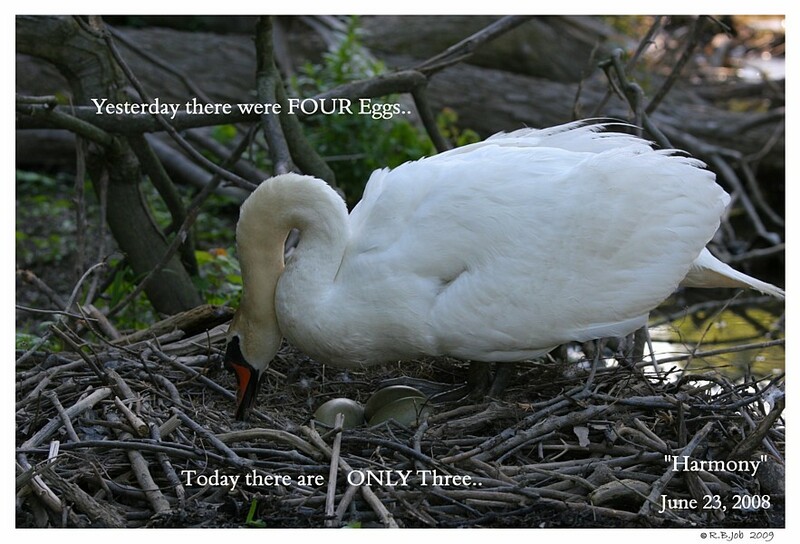 UNLESS there are Eggs Missing.. !!!! 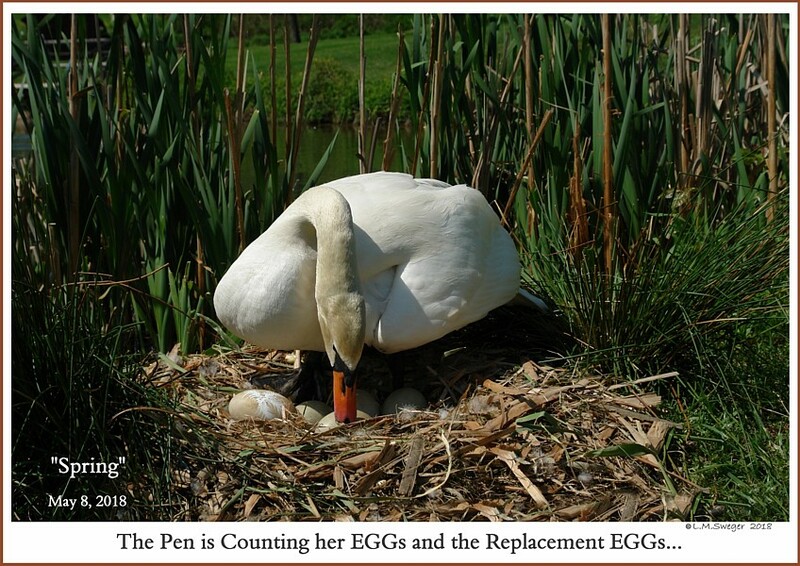 Swan Pens frequently Lose Eggs during the Nesting Season. 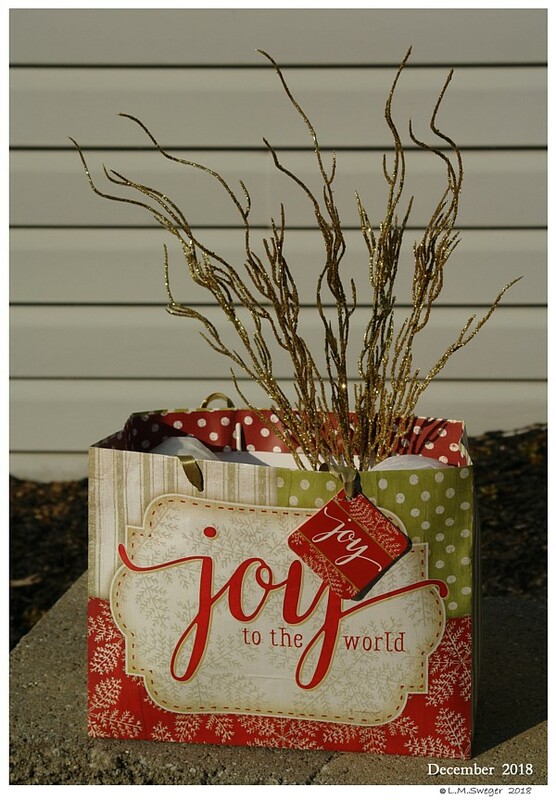 for the 42 Days to Prevent Recycling. 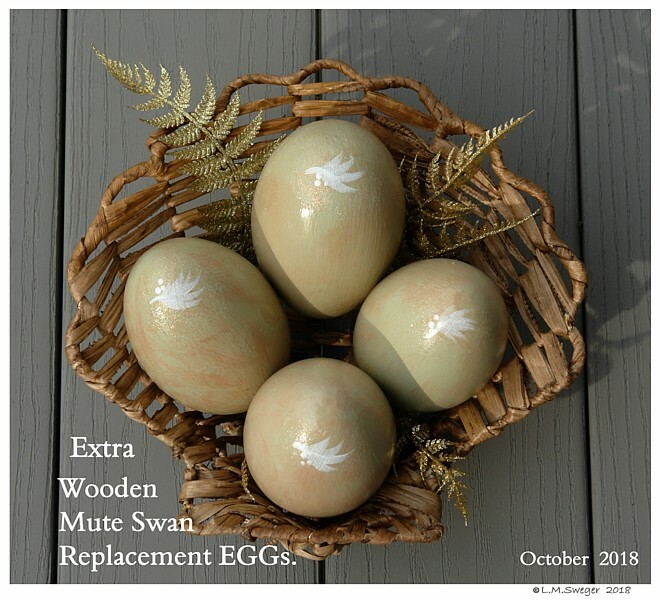 KEEP the Extra Wooden Replacement Eggs as Spares. 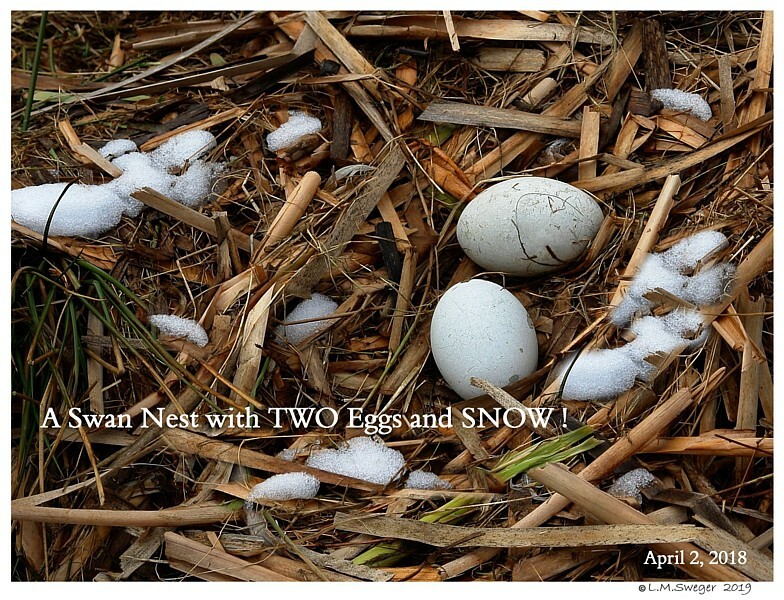 There may be some Losses over Time by Raccoons or People..
ON Day 42 – Remove ALL Eggs from the Nest. 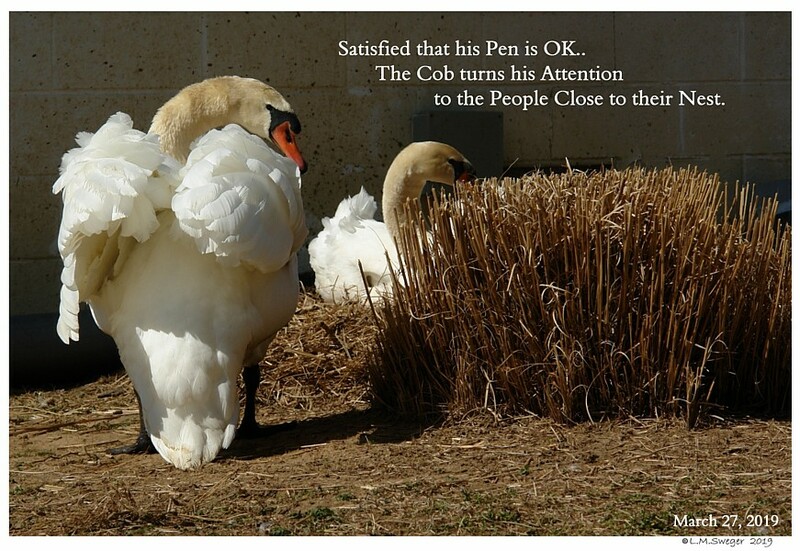 This way the Pen will Start to Eat Again..Avoid Starvation. 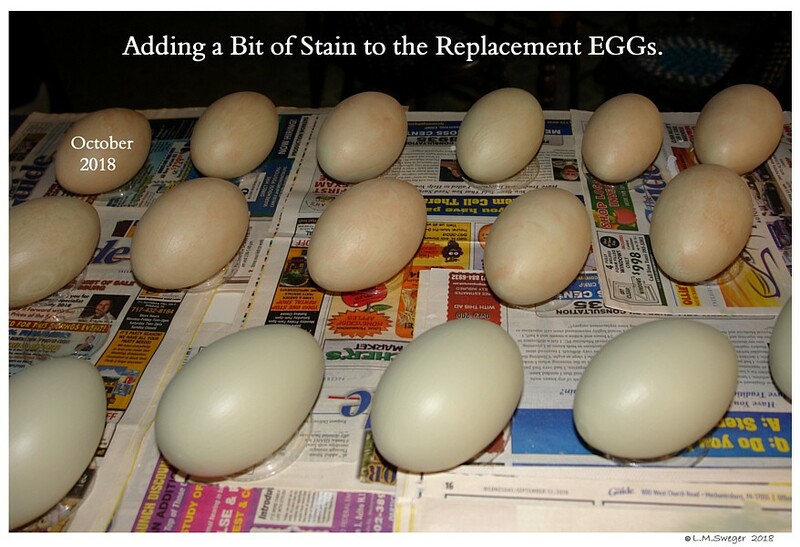 Wipe Replacement Eggs with Soapy Water on a Terry Cloth. 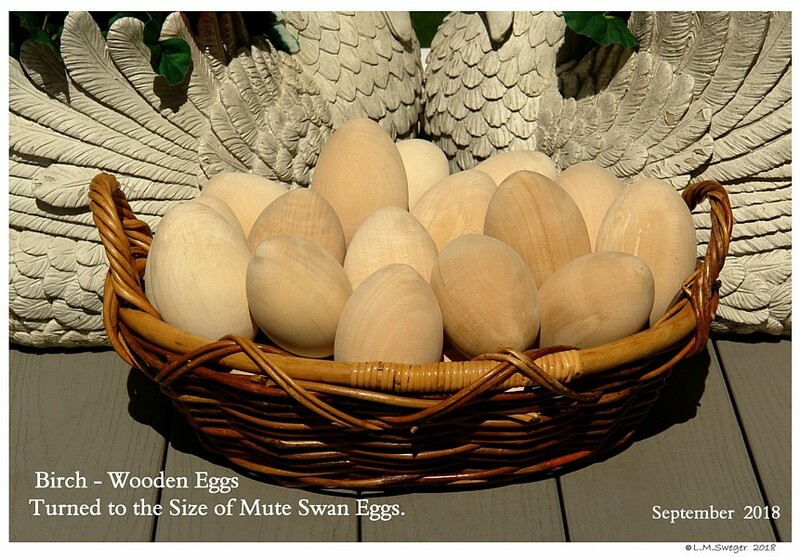 DO NOT Soak Wooden Eggs. 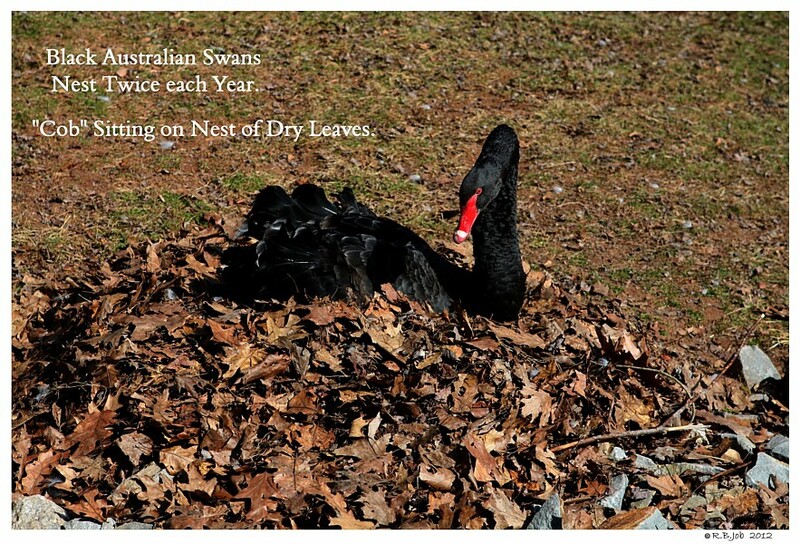 Rinse, DRY Well. Store for Next Year. 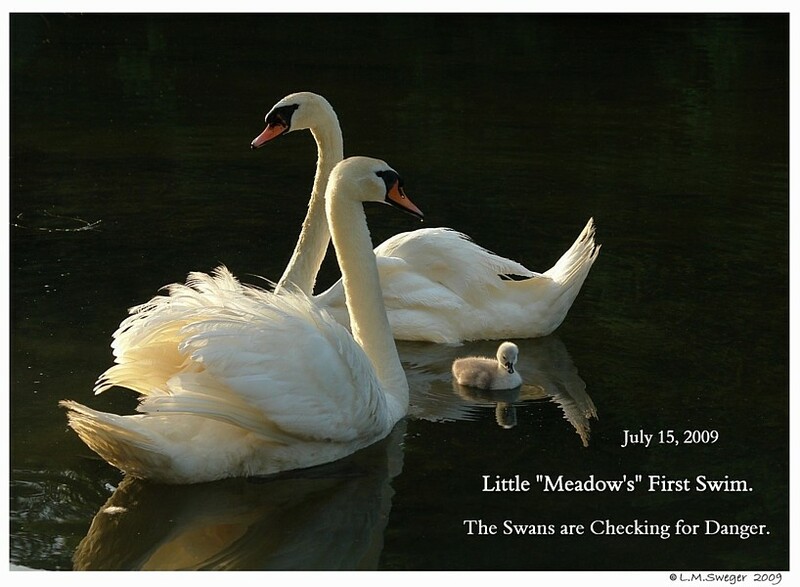 Remember WHERE they ARE ! 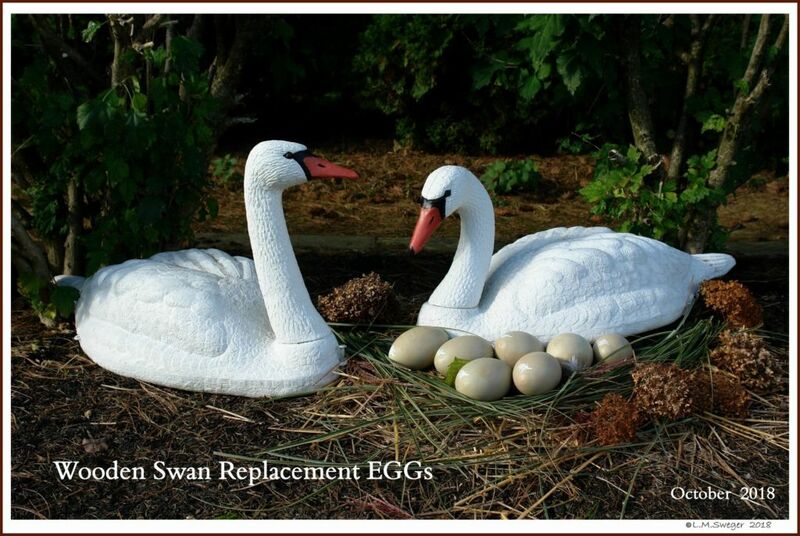 REPLACEMENT EGGs Painted over the Winter..
An Example of a Replacement Egg Swap-Out. 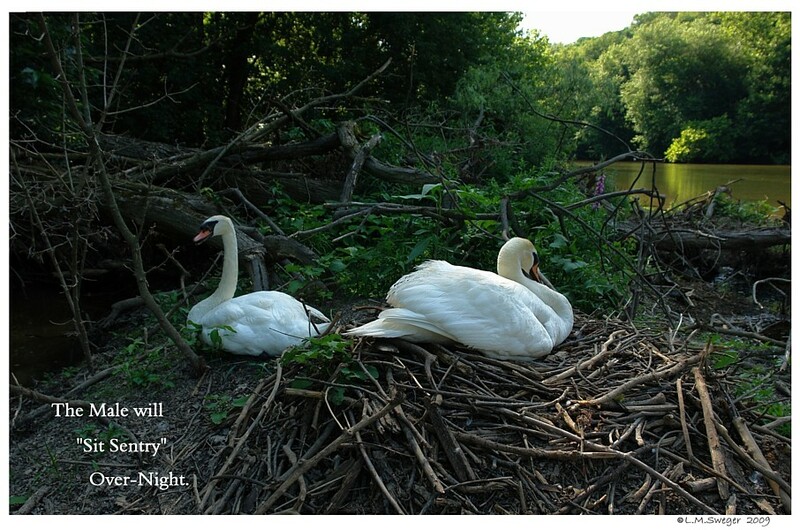 Take a Few Minutes to Observe the Nesting Swans.. 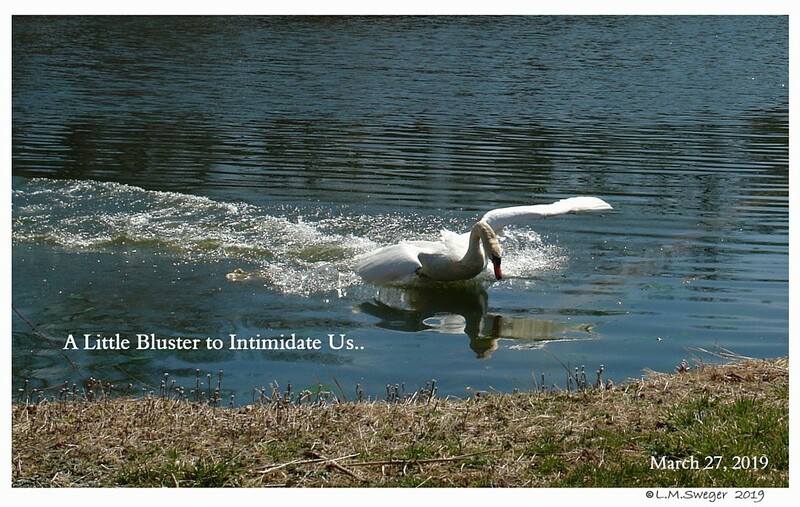 Walk Slowly – Get Closer a Little at a Time.. 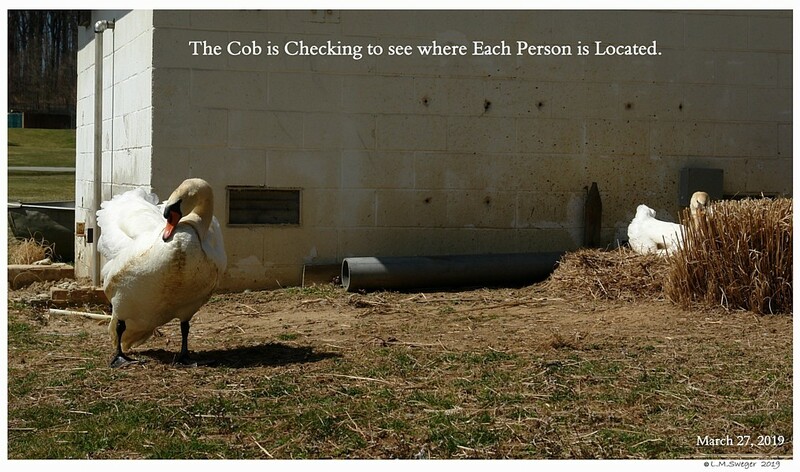 It is Typical for the Cob to be Patrolling Near the Nest Site. 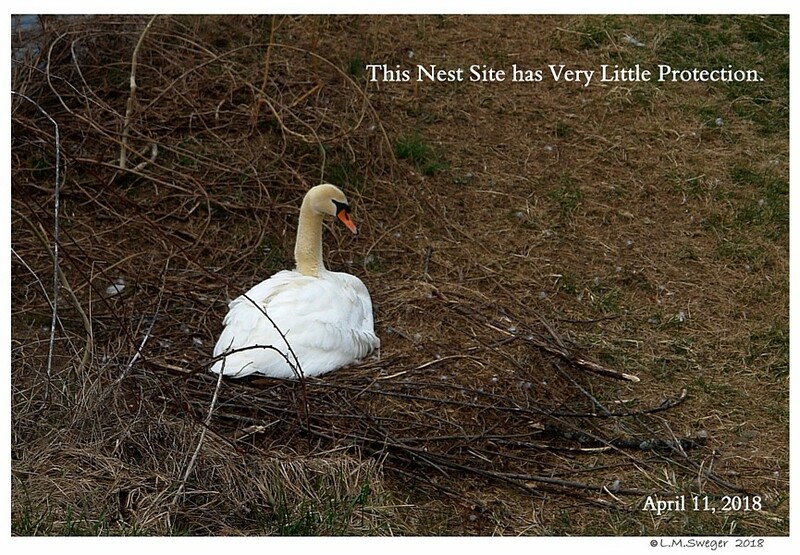 This will be the Pen’s Fourth Spring to Nest. 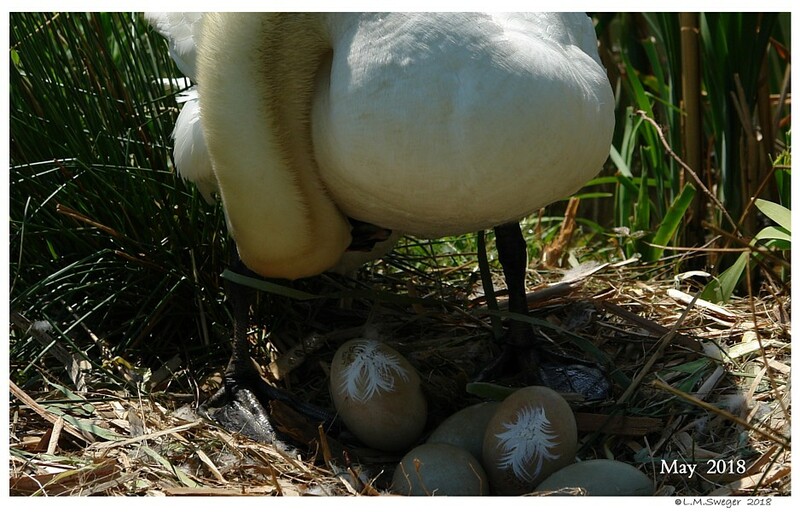 She is Dedicated to her Eggs. Our Helpers were in Place, Ready to Start this Swap-Out. 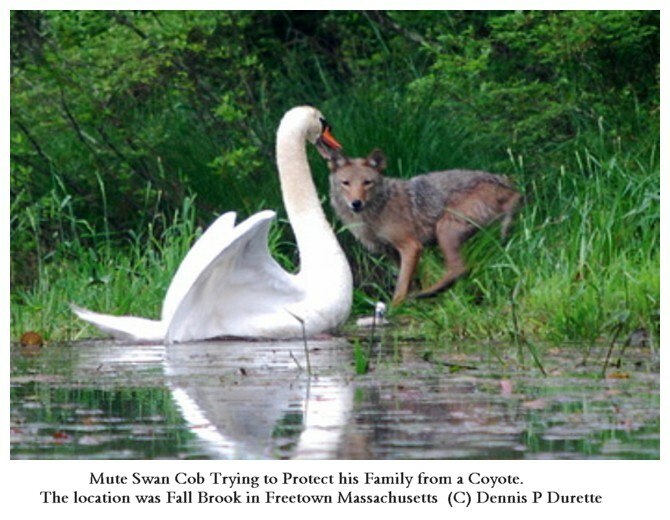 to see if the Cob would come out to Protect his Female. 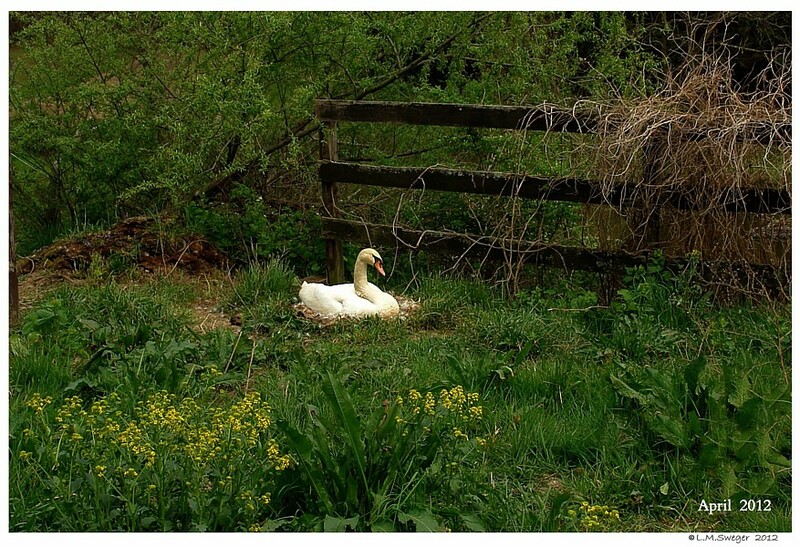 Giving the Cob a Little Space to Come up to the Lawn-Nest Area. 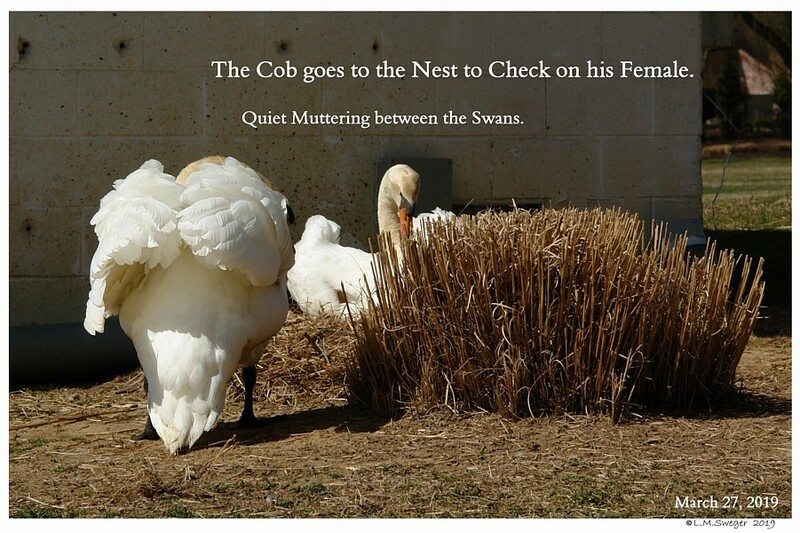 So Sweet, the Cob goes to Make Sure his Female is Safe. Now it is TIME for him to CHASE Us OFF.. So Predictable. 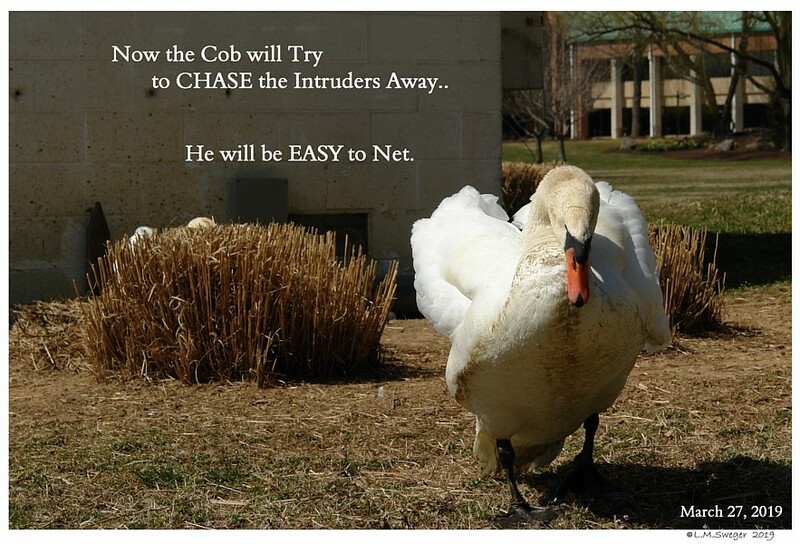 The Cob was EASY to Net. He came Directly to Us. OOPs !! 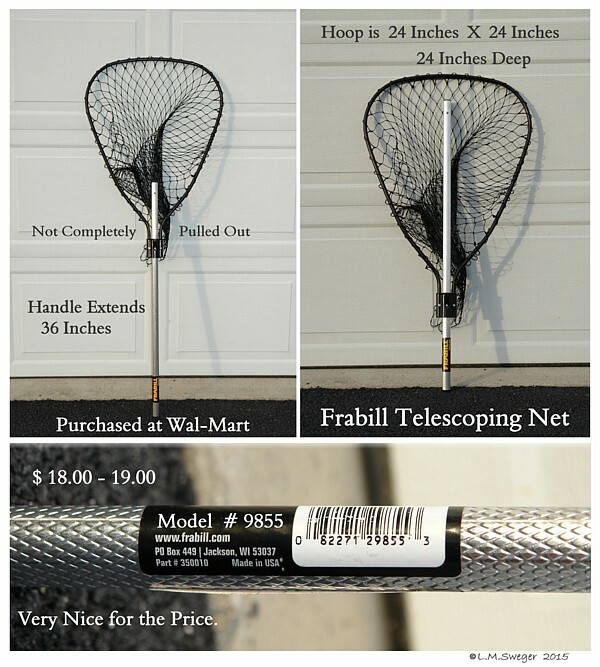 Be Sure the Net Hoop is Securely on the Ground. 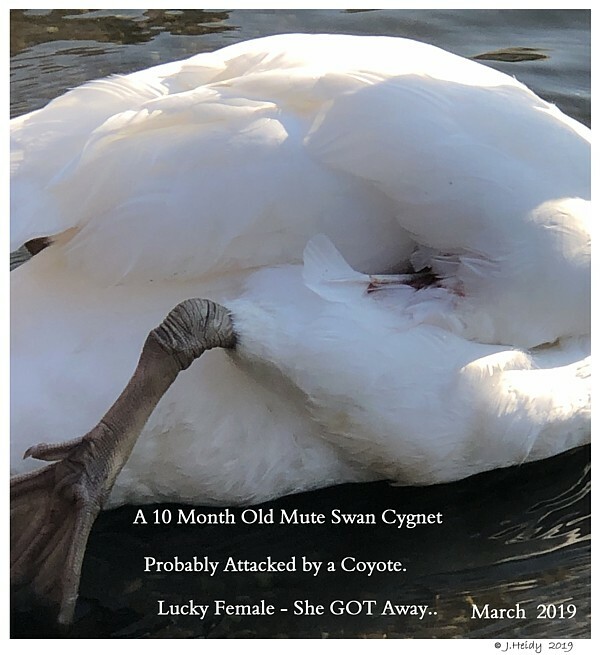 Swans are Good at Wiggling out UNDER any Open Spot . 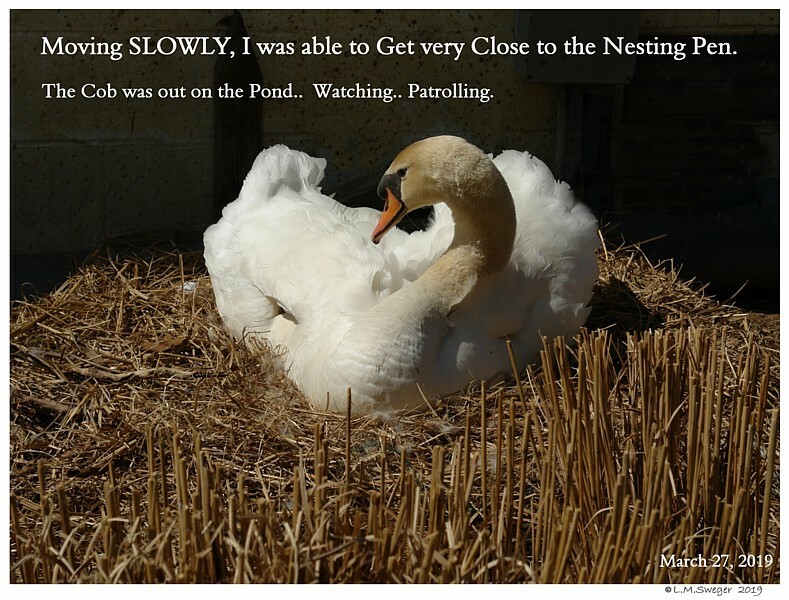 Check his Neck is Not Twisted and he is Breathing OK.
We Slowly Move the Pen off the Nest with a Lawn Chair. Do this Slowly, give her Time to Stand-up and Move Away. 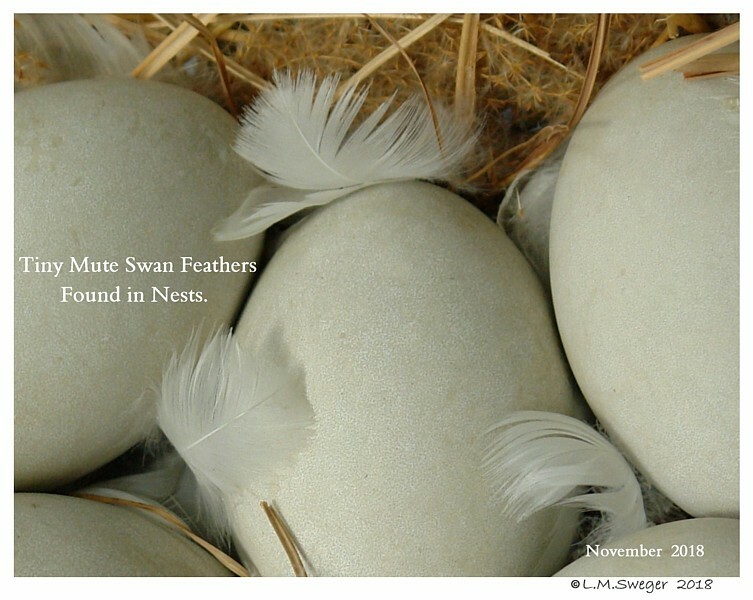 The Nest contained a Large Clutch of 8 Eggs. Working Quickly, I did not Snap Photos that were Focused. DARN !! 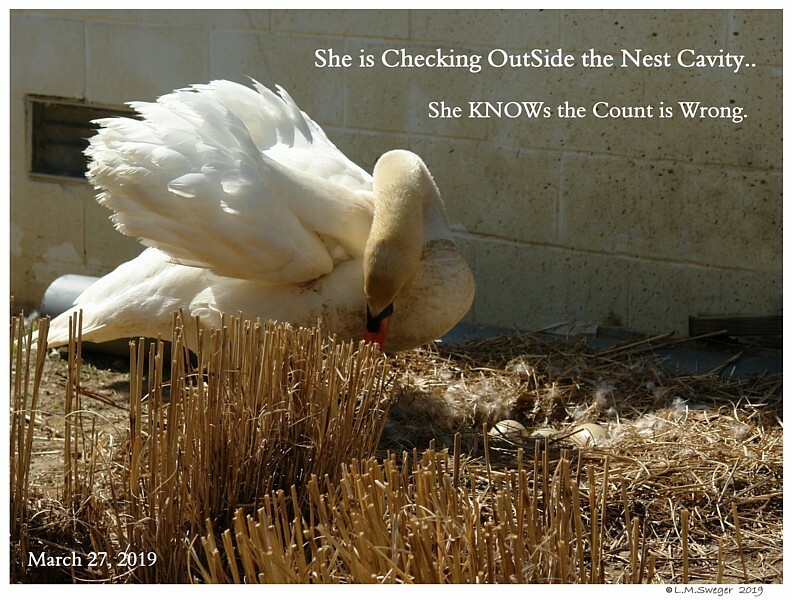 The Clutch below is an Example from a Nest in 2017 !! 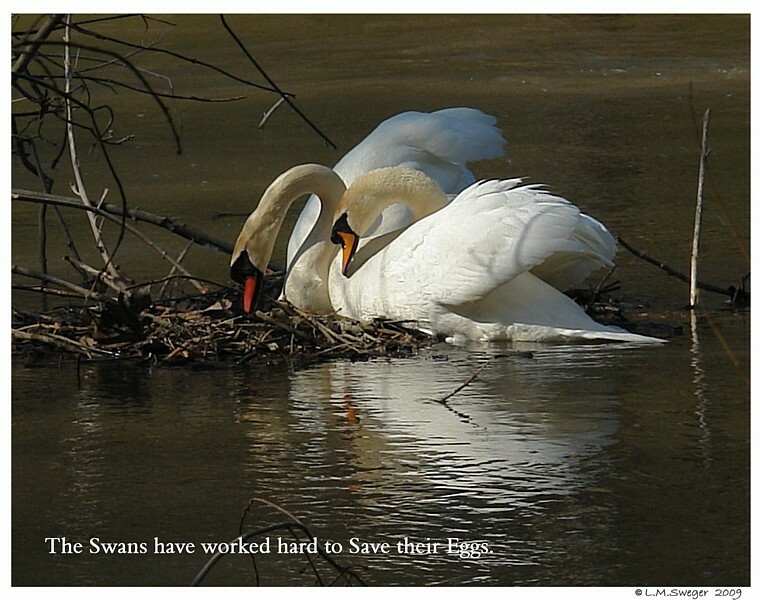 We Removed 5 Real Swan Eggs and Placed 3 Replacements in the Nest. 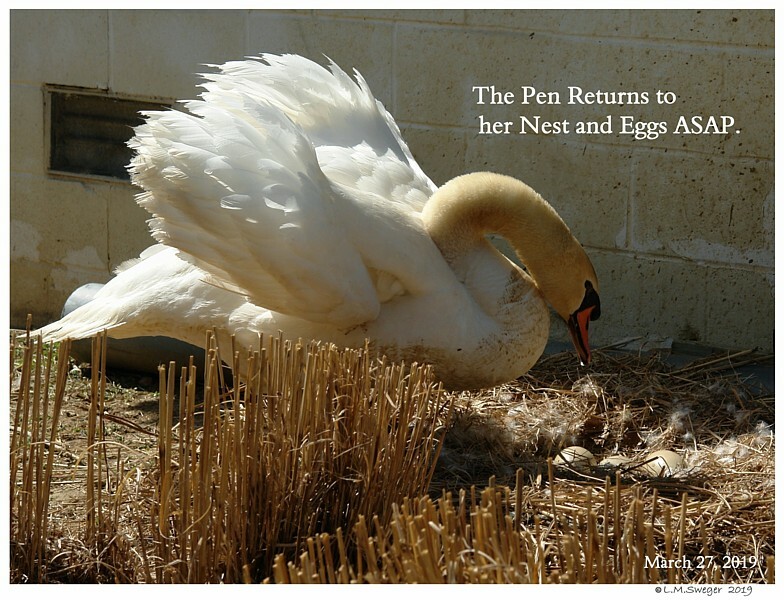 We Stepped back so the Pen could Return to her Nest. 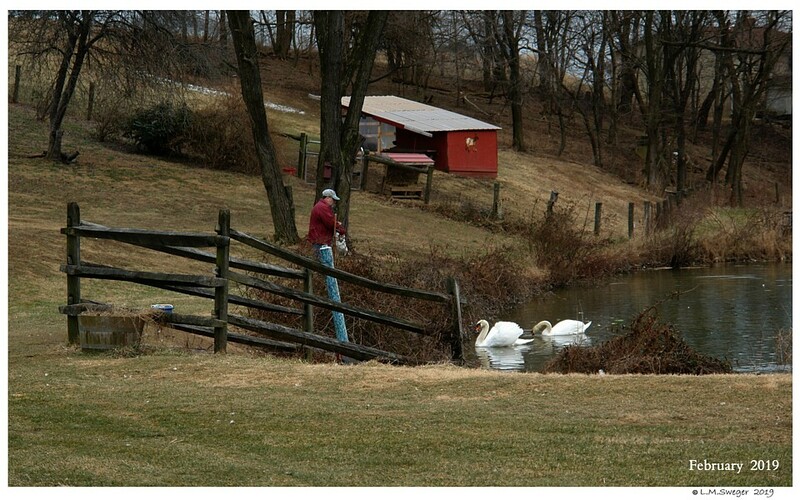 These Image Tell the Story. 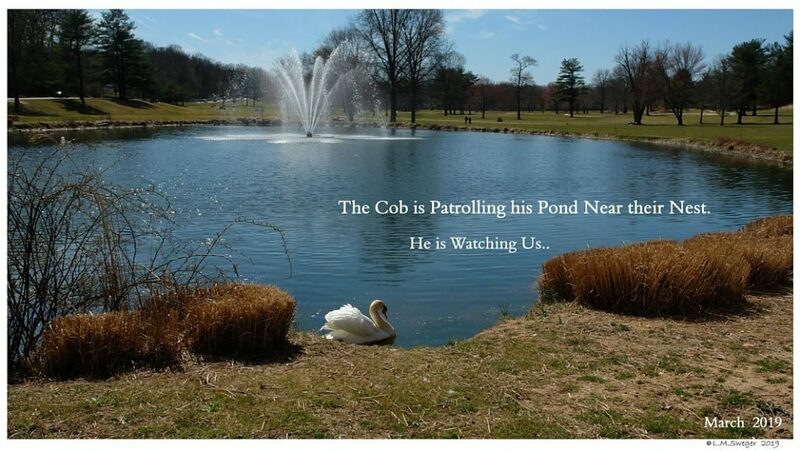 The Cob was Release and Went back to the Pond. We Watched for about 5 Minutes. 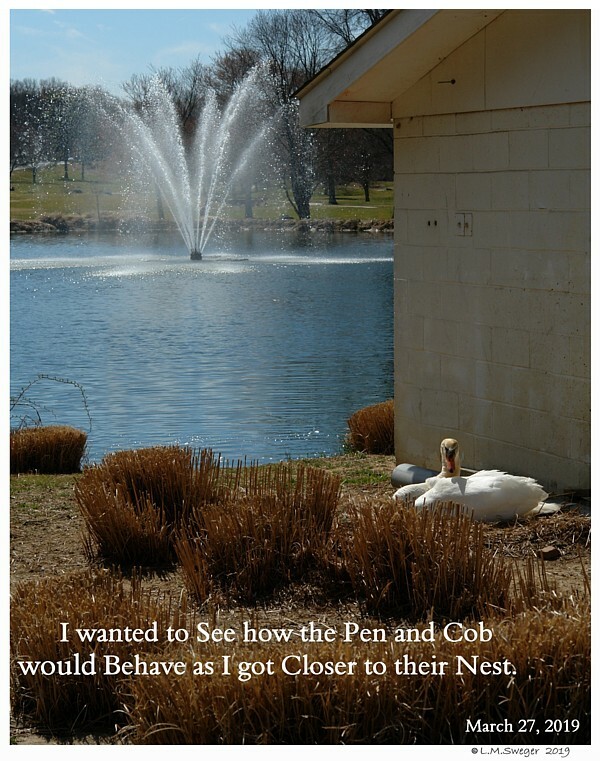 The Pen Settled Down on the Nest. 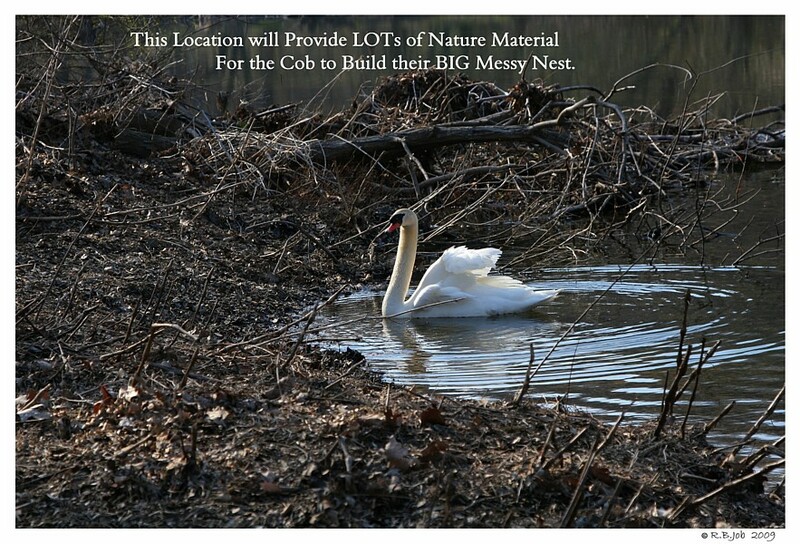 This Mute Swan Pen will Need to Sit on the Nest for 4 more Weeks. 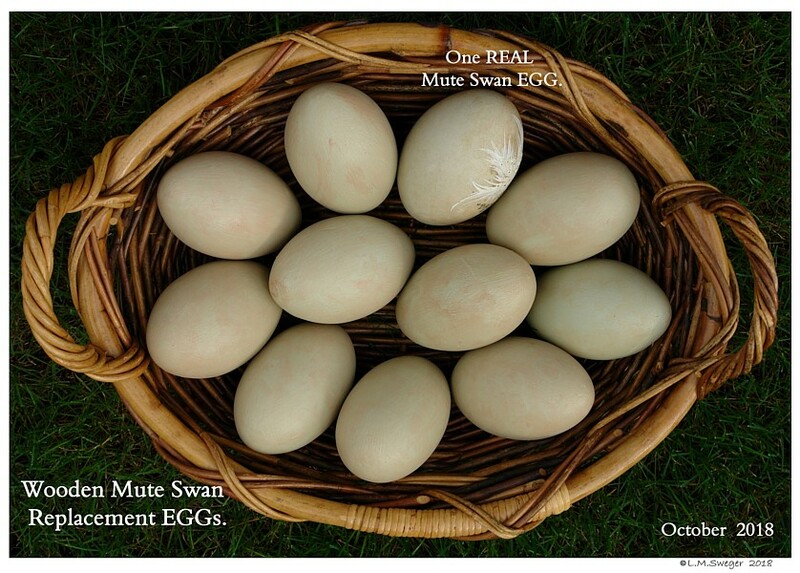 In One Week the Remaining REAL Eggs will be Removed. She will Continue to “Sit” on the Three Replacement Eggs. She will Accept them as hers. 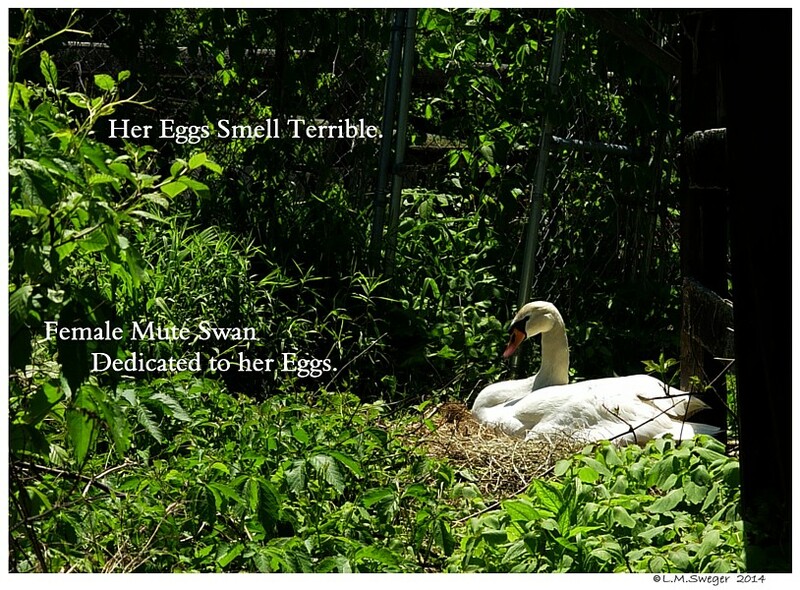 They will Smell like her and the Nest. 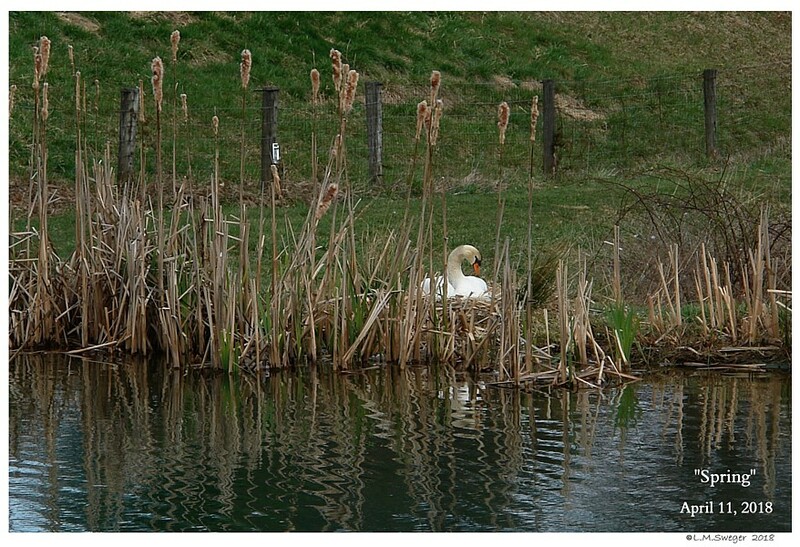 Swan of Beauty, Swan of Grace. A Queen among her Ancient Race. 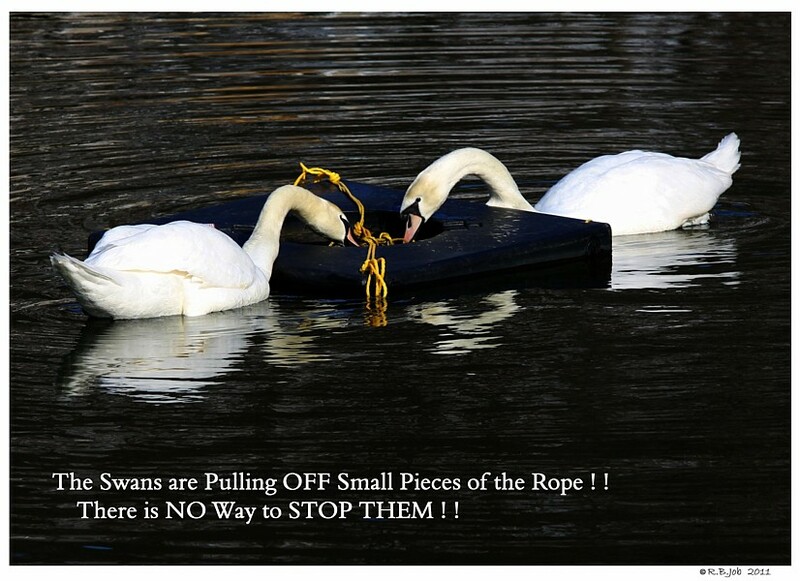 The Swan – by Susa Morgan Black.